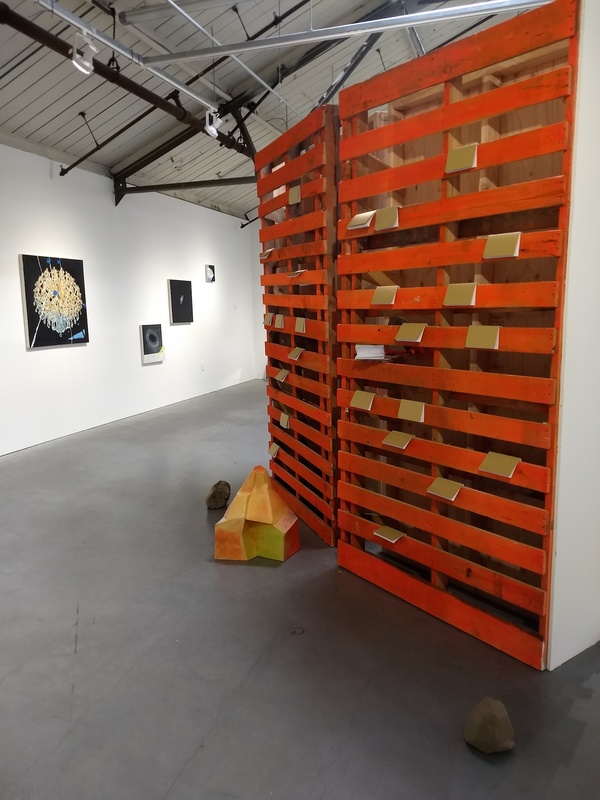 Emergent Art Space contributor Uji Venkat walks us through her experience at the opening of the XL Catlin Awards Exhibition, in the new space of the San Francisco Art Institute, sharing her thoughts as well as her interview with Kennedy Morgan, one of the artists in the show. 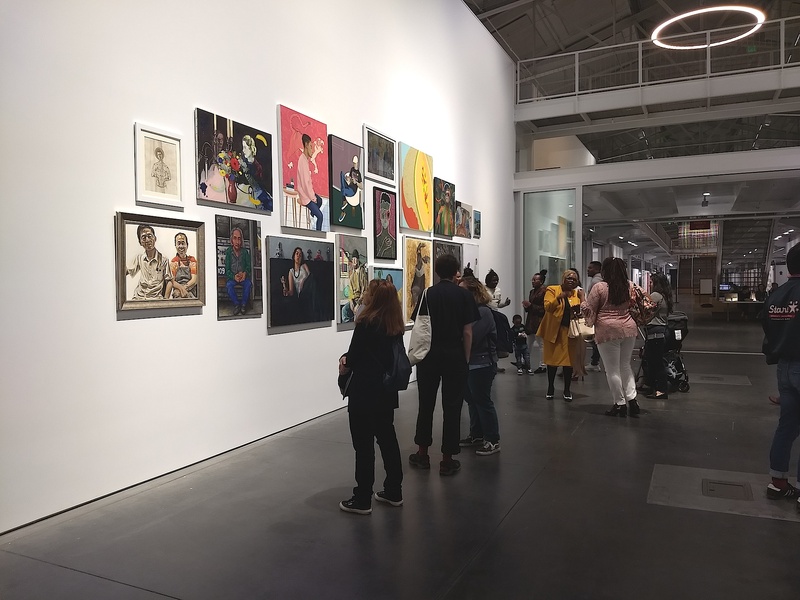 Opening night at the San Francisco Art Institute’s XL Catlin exhibition brought a diverse audience to a warehouse at Fort Mason, showcasing figurative works by forty artists from four countries and nineteen states. With a backdrop of San Francisco lights reflecting in the bay against the dark sky, the illuminated white interiors of the warehouse provided a striking contrast. This is the first year that the XL Catlin Awards exhibition has come to the United States, following a ten-year running scholarship award in London. 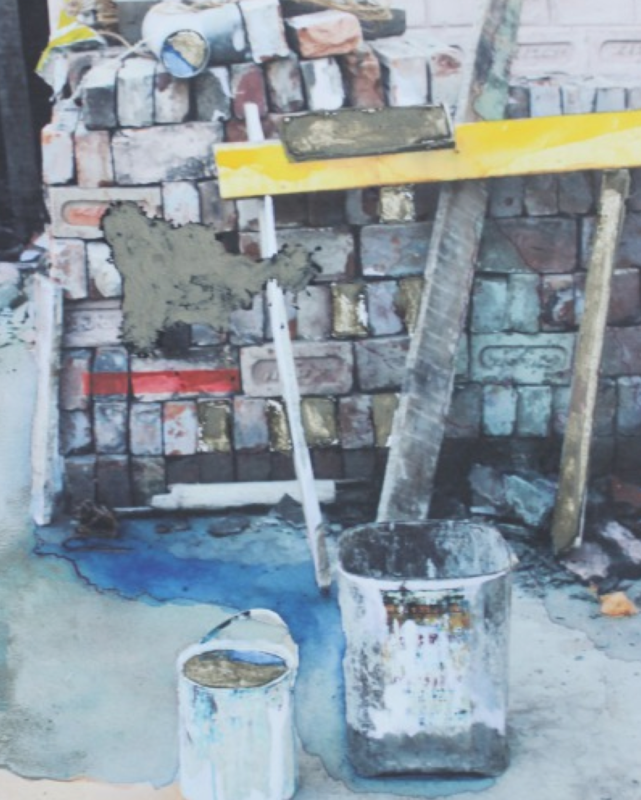 The award highlights up-and- coming, innovative young artists. The audience was as vast and different as the pieces. An amalgamation of races and ages colored the walls and the halls. 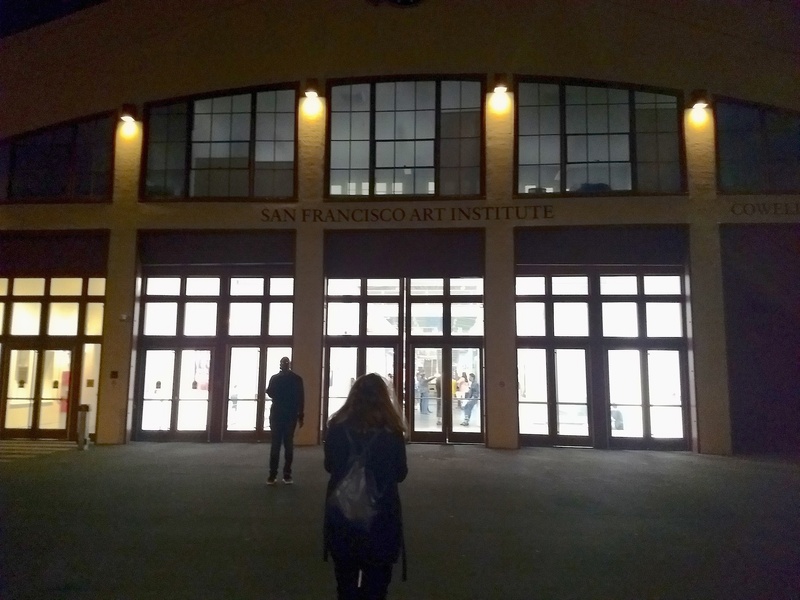 We saw students, their families, curators, art enthusiasts, and even the occasional techie, given that the San Francisco Bay Area is a rapidly growing hub for the technology industry. When I arrived, I received a minimalist styled, beautifully printed and bound, color catalogue that was free for attendees. 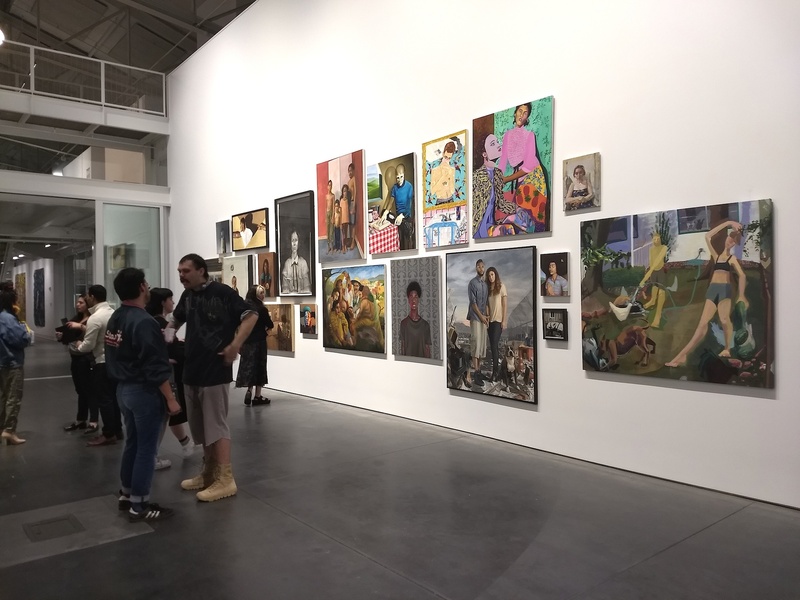 It contained an image of each piece presented in the exhibition alongside a snapshot of the artist with statements about their muses and approaches. This in conjunction with the show’s free admission created a sphere of accessibility beyond the reach of traditional gallery shows or museums. Many pieces were founded in powerful stories. Among them was Jaden. The piece is one in a series of five, depicting a young African American man with a sullen expression and a captivating, direct gaze. His sealed lips have a voice and his body has a presence. There is a red light cast upon the left side of his face and neck, signifying the “danger” current cases, law enforcement, and the political climate have portrayed. 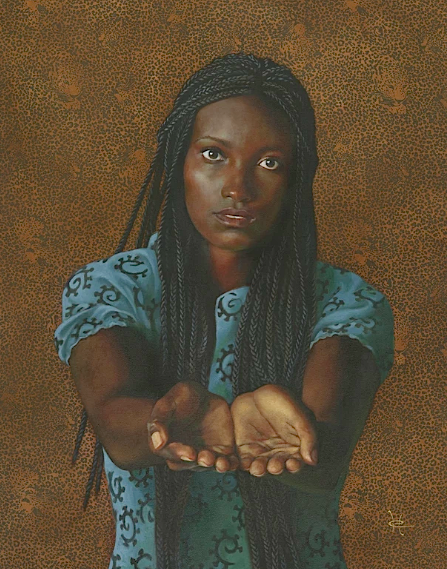 Artist Monica Ikegwu of the Maryland Institute College of Art sheds light on what we are told, what we perceive, and the assumptions we make as a result. Her work, as I have often found in visual arts in contrast to other art forms, illuminates issues without imposing an opinion on the viewer. It merely incites a reconsideration of preconceived notions, to find evidence for judgements. Ikegwu says in her artist statement, “Entering this competition would allow me to share my work with a broad spectrum of people who have never been exposed to my work before.”(4) With the United States being a nation of immigrants, this piece calls attention to the appalling and still ubiquitous racial profiling. I was awestruck by the empathy and mission these young voices shared. Many of them portrayed influential figures or loved ones in their lives. They emulated the ways they would interact with the world, and portrayed the biases, prejudices, and challenges they face while celebrating the accomplishments and powers they have worked for. Drawing attention to this still widespread atrocity and Bradley’s cause is the added contribution of Candari’s piece. As a part of this award show, this piece will travel to three of the priciest US cities, where the vast majority of viewers have not had remotely similar trials or emotions. 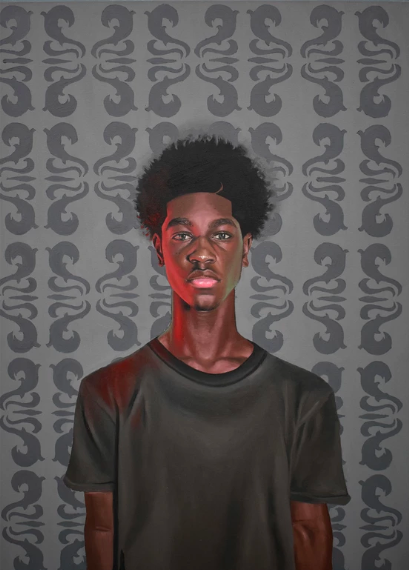 These artists, as early as their late teens, are broadening their focus beyond self reflection so their work can connect to a wider audience. Breaking molds through conversation and media, the finalists of the 2018 XL Catlin Award were very conscious about creating approachable pieces. Earlier in her art career, Morgan adhered to hyper realism with the aspiration that “people would connect to something in the art.”(7) As she expanded her work, she started to focus on detail. Detail can be a connection to the audience, but a greater abstraction moves beyond “this looks good” and helps the viewer ruminate on the subject and message. Comfortable with media such as intaglio, acrylic, and charcoal, Kennedy has started to work more with sculpture, playing with dimensions. She surprised herself with her growing love for contemporary art. Her eighth-grade art class, close friends, and open access studios inspired her to curate a show in high school. Centrally located in Santa Monica (10) with no admission fee, her audience consisted mostly of people walking by. Curating encouraged her to consider her audience even more. While she had participated in many shows with friends in high school, curating was a very different experience. Kennedy explains that despite her evolving interests, she has chosen to be a painting major: “I have ideas for large scale paintings. The new space of the San Francisco Art Institute at Fort Mason gives us the chance to actually do that. They give us the wall space, the studio space, the workshop to build stretcher bars. That is where I want to be--to actually make work and large-scale work. The studio allows us to do that, which is so cool." Morgan had started exploring fabric textures in 2015, when she was working on what eventually became her submission for the XL Catlin show. 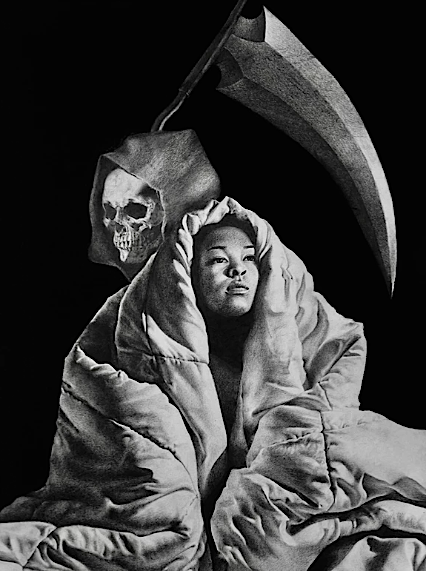 She plays with the eye-catching contrast of black and white and a figure of death. “Everything has an end. Beauty doesn’t last forever. There is a sense of my being under control of a source that I can’t even see. It’s inevitable that I’m going to die...That’s a force that I’m not in control of. But there is also a strong theme of light on me. And I’m looking into it and the future. I see that I have control of what I can do with this life and so, I am also in control.” While her pieces are founded in her present, she “want[s] everybody to see themselves in this painting.” Considering the obstacles, will and perseverance breed opportunity as these forty brave young artists and their inspirations continue to prove. While art can become a very introspective practice, the nature of an art community, built through a school, awards or otherwise, is that of collaboration. Emergent Art Space, like other art communities, thrives because of the visibility and discussion it creates. Exhibitions, articles, forums, blogs, and conversations are only the tip of the iceberg for the creativity that such a community fosters. 1. The show in the US started in San Francisco at the Art Institute and traveled to the Chicago Art Institute, then New York Academy of Art. Judges included curators: Ian Altveer, Jennie Goldstein, Laura Hoptman, and Kara Vander Weg from the Metropolitan Museum of Art, the Whitney Museum, the Museum of Modern Art, and the private Gagosian Gallery. 2. The salon style presentation at the San Francisco Art Institute was organized by Katie Hood Morgan, Curator of Special Projects, and Christopher Squier, Exhibitions and Public Programs Coordinator. 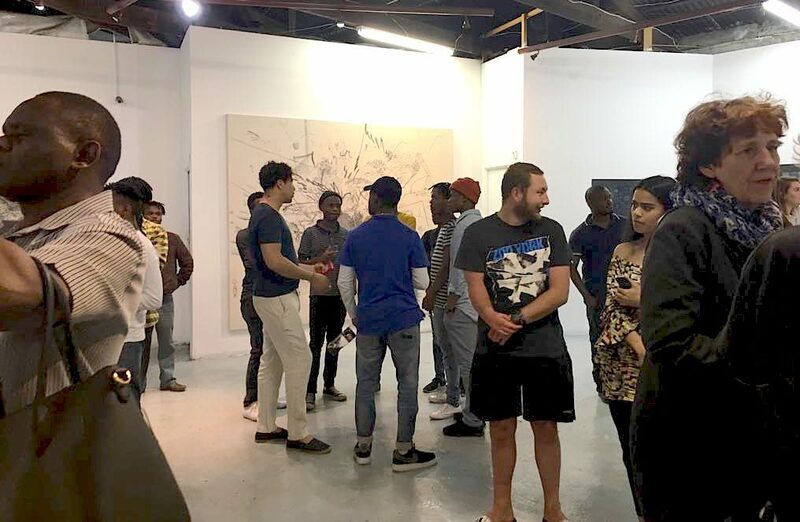 A review of the 'Last Image Show', the young artists international exhibition curated by Gadi Ramadhani in collaboration with Emergent Art Space at the Alliance Française of Dar es Salaam, by artist and writer Valerie Amani in Tanzania. The primacy of sight is one of our earliest lessons. We demand, deeply, instinctively, that things declare themselves to our eyes before approaching any of the other senses. We learn earlier than we perhaps learn anything else that the things that wish us harm wish first not to be seen; and we see first, before thinking, before feeling, and at times before knowing. Our innate longing to see in order to believe must have crossed the minds of the first visual artists; an active function of art has been to lure, with inferences of spectacle, an audience that will then be confronted into something more fully sensory. Silence, as a premise, is a subversion of this. Silence, seemingly so close to nothing—key to our conception of nothing— as a theme, guarantees nothing. If it lures the audience, then it lures with the purest of promises - a promise of looking into the unknown, of understanding the unspoken. Silence is perhaps one of the rare themes more suited to being presented in an exhibition space than on a page. It is a theme that most lends itself to curation, whose notes can be heard in choice of placement and style of arrangement as much as in the ideas contained in what is arranged. 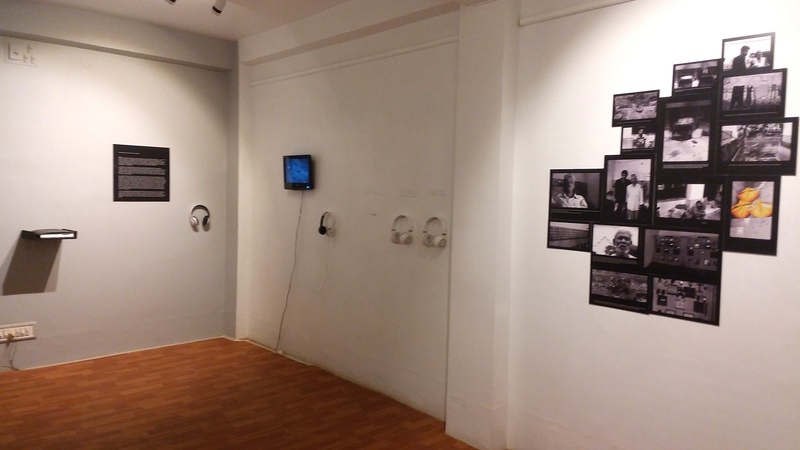 The 'Last Image Show', is a journey that began from a journey between Dar es salaam and San Francisco. Gadi Ramadhani, artist and curator, was the 'architect' behind it, alongside Emergent Art Space acting as a catalyst for the realization of this international art exhibition. 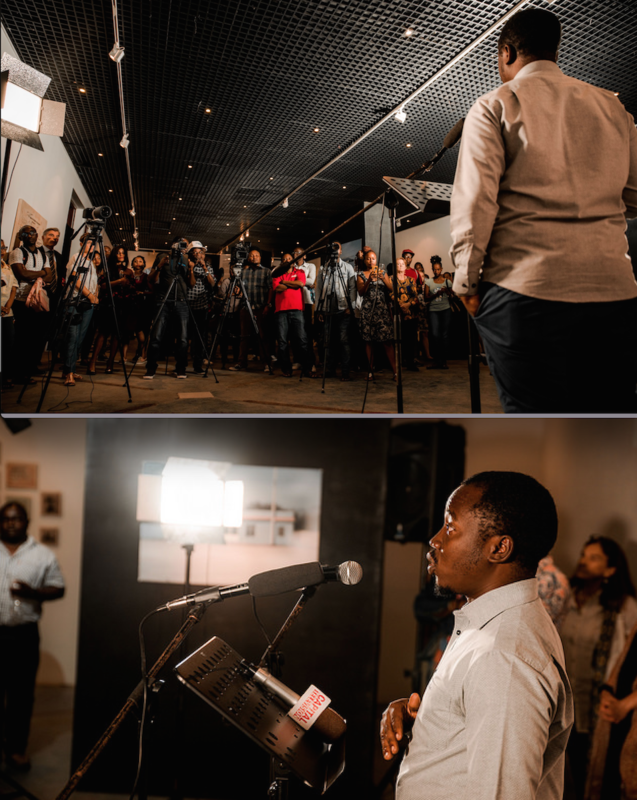 Both Ramadhani and the Emergent Art Space team aimed to bring the work of young artists from around the globe to Tanzania. They succeeded by featuring an array of visual art works by 33 artists, spanning 4 continents and 21 countries. Artists employed a diversity of media but were united in confronting the common theme of Silence. 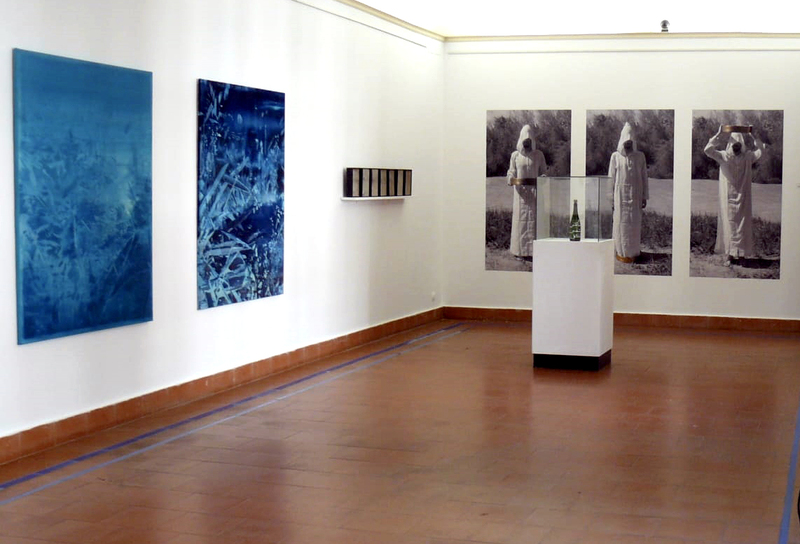 Exhibtion space shot, showing black display units set at angles in the gallery within the white walled space. Through this lens, silence becomes the gravest of weights - if enforced it is the unfortunate worldwide shorthand, for the common act of forcing men and women to live their inward pain in stances of contentment. The artists participating in the 'Last Image Show' were asked to respond to this kind of silence: silence birthed from fear, oppression or lack of representation. 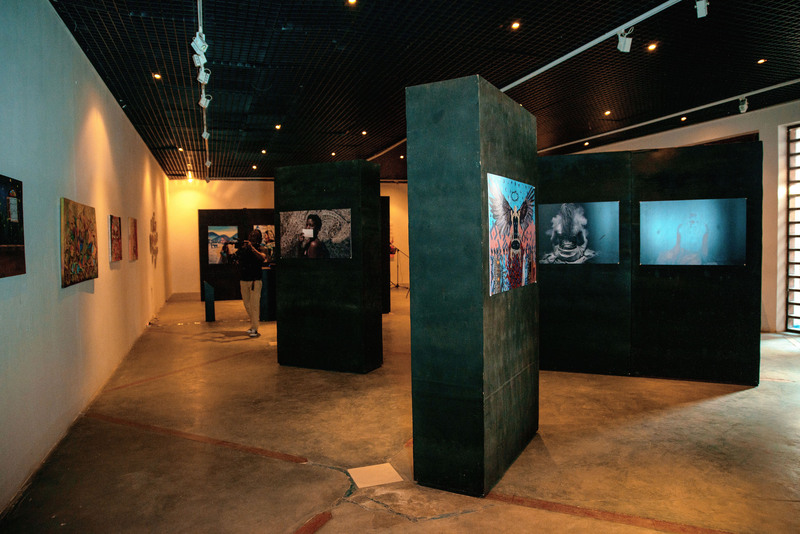 The chosen space was the Alliance Française gallery in Dar es salaam, where Ramadhani, as curator, guided their visions with a sparse, fractured arrangement – white wall around large black units that sit together intimately, like a maze. Stories wrapped in that singular noiseless body, side by side, swung from the unsaid to the unsayable. With such a wide array of multidisciplinary international artists, the exhibition achieved a certain irony on first sight: a slight disconnect on the wonder and variety of ways the chosen artists are able to speak their truths about the unspoken. However, close observations of each piece created a unique intra-language of human sincerity. This sincerity came in different forms. GCC Exploration, a photo series by Aisha Jemila Daniels (Qatar), is almost playful in its approach, confronting its subject with a millennial marriage of true concern and self-detachment. 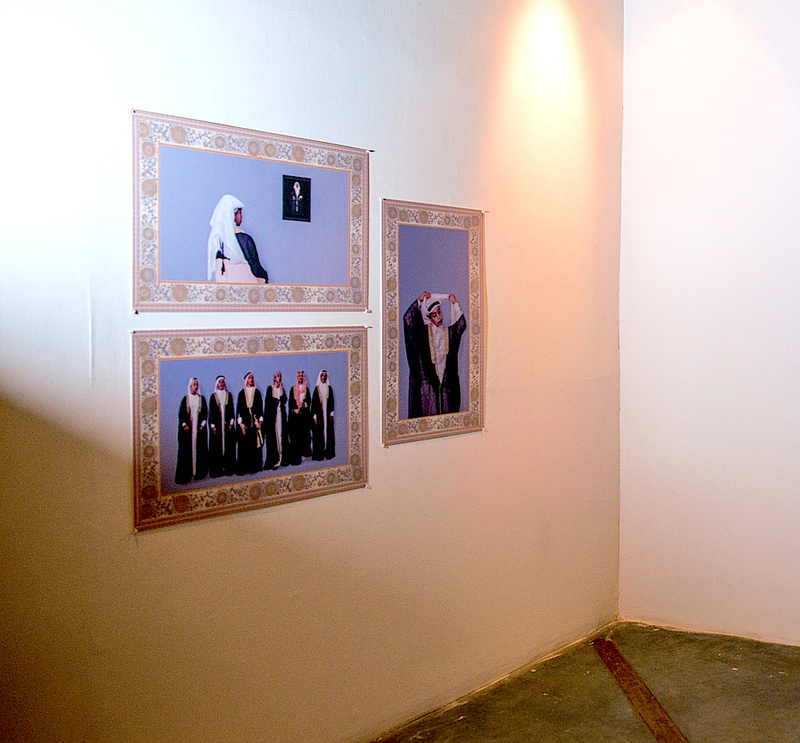 The artist poses in the royal garb of Arabian sheiks in self-aware stances. She evokes the self-obsession typical of the internet age and, by doing so, both subverts the masculine imagery of middle eastern politics and critiques the tendency of the elite to deify individual voices. Daniels' is one in a number of works examining the silence of women. Another exhibiting artist, Gladys Kalichini (Zambia) offers in her statement, “the erasure of women’s voices from history and collective memory". She is speaking specifically of Zambian history; and her work, projected photos in black and white featuring a woman covered in white powder. Her works flirt with burial and exhaustion - presenting the subject as steadfast, but perpetually close to defeat. She represents the fragile miracle of remaining. Kalichini’s photos are effectively paired by Ramadhani with the work of Eze Mariagoretti Chinenye (Nigeria), whose photo Mystification of Womanhood - features a woman whose face is tangled by strings that rise from the sack she wears. She stands at an angle, projecting a stare containing a fury that screams for freedom. The exhibit was not limited to silences of the individual. 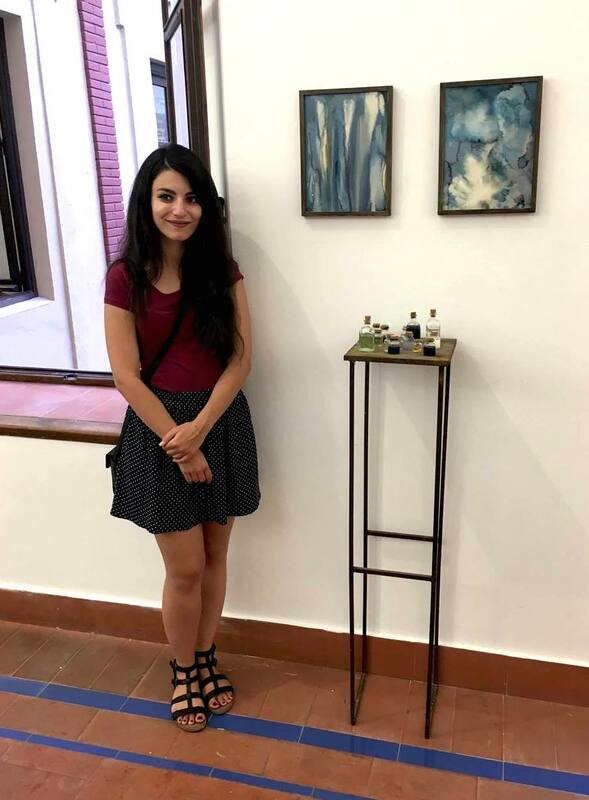 Asmaa Elmongi (Egypt) presented her painting as a mind map, with different forms of silence circling one central theme, fear. Her piece, I Need to Talk, depicts what looks like a diagram of reconstructed skeletons of ancient creatures. The unfamiliarity of the bones, paired with her biological diagrams, present silence as part of our outdated understanding of fear. They appear to represent the manner in which we seek to extinguish, rather than understand the things that make us fearful. Nature also features in the work of Dengke Chen (China/US), who uses cutting edge technology, in this case augmented reality, to question our understanding. One work, Tank Man, deconstructs the iconic Tiananmen Square protest; that of a student standing tall before a line of tanks. 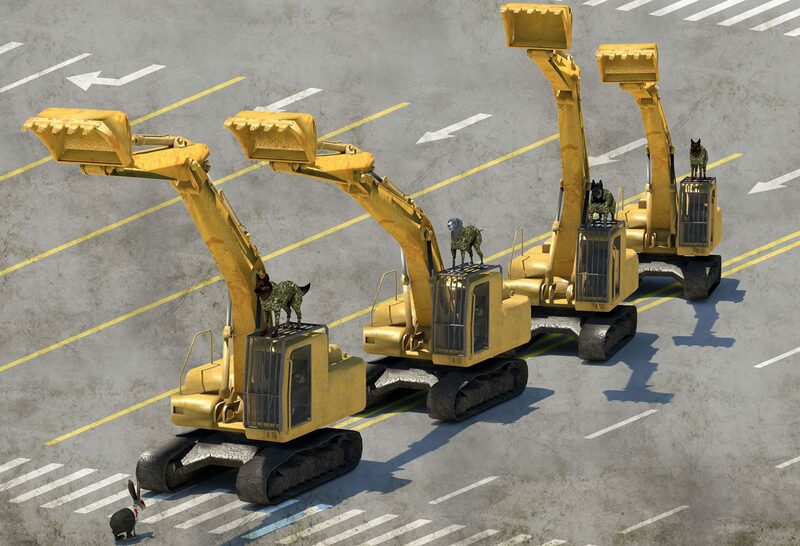 He turns the tanks into bright yellow diggers and places dogs on top of each and a rabbit in place of the student, as if to ask whether such courageous acts are too removed from modern consumption. I wonder whether the way we learn and understand each other is now so removed from reality that even courage needs to be colored in to appear less vividly factual and more processed. 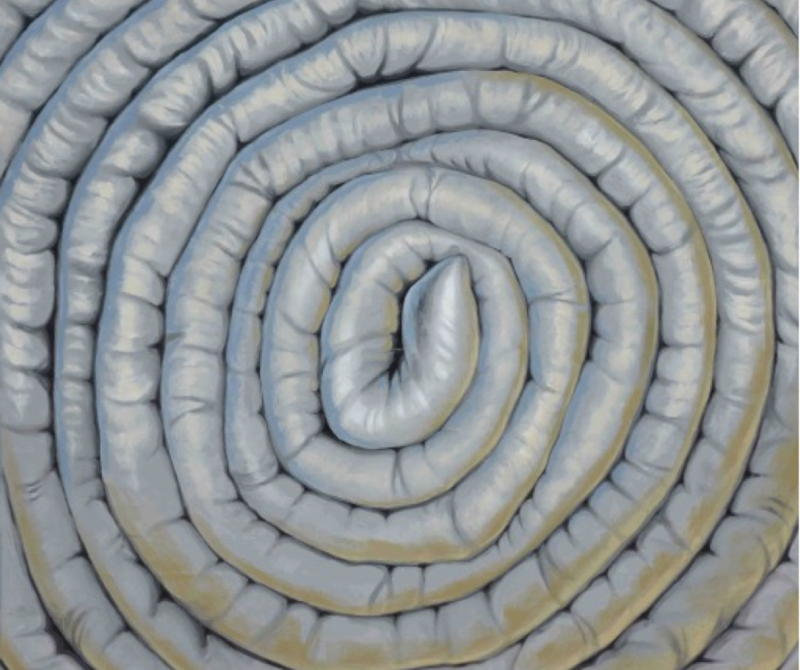 The exhibition also featured a striking work by Kristina Rutar (Slovenia), whose fetal-like sculptures hung near the center of the floor piece, like something alive but biding its time, silent only for the moment. While the depictions by Isha Bawiskar (India) of childlike night scenes presented hope and a different kind of silence, one containing curiosity and the potential of wonder. Her dreamlike mirage provides a contrast that perhaps encapsulates the overall effect of the exhibition; that the purpose of instilled silence is to inhibit creative enquiry and limit the world we see to only the things we are told about it. The exhibition makes us travel from city to city, achieving its aims. It reminds us to open our eyes a little wider so as to not be blind to the rich texture of existence. Valerie Amani is a fashion designer and visual artist based in Dar es salaam, Tanzania with a passion for writing. She is currently the Visual Art Program manager at Nafasi Art Space, one of the leading contemporary art platform in the country, while designing for her fashion brand Kahvarah. She uses digital platforms to share her art and writing, and is currently working on developing a program that will educate and support young female artists in Tanzania. 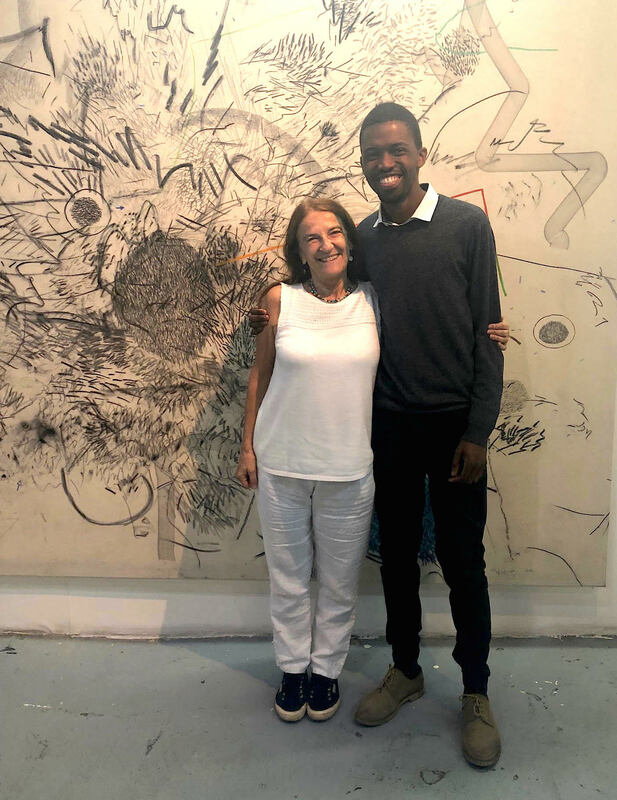 On September 20th the Emergent Art Space team had the pleasure of attending the opening of South African artist Pebofatso Mokoena's solo exhibition at the Bag Factory in Johannesburg. We are very happy to publish here, with the artist's permission, the catalog of the exhibition. 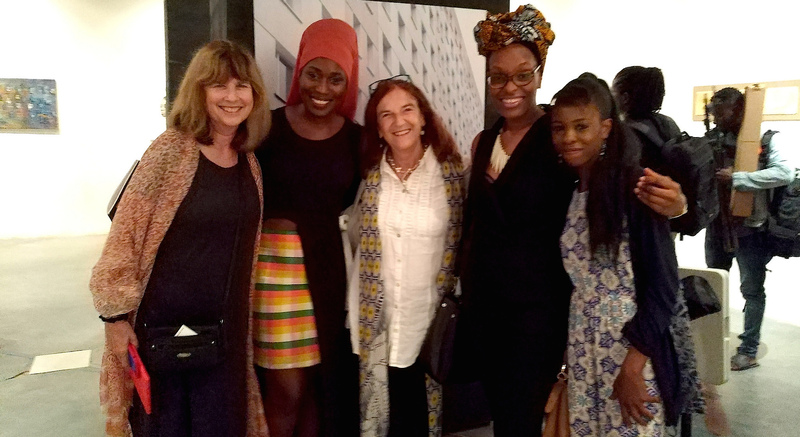 A fortunate coincidence a few weeks ago allowed me and Ann Wettrich, EAS Directors of programs, to attend the opening of Pebofatso's exhibition in Johannesburg, South Africa. We have known Pebo's work for more than three years, albeit in virtual form, thanks to his presence on the Emergent Art Space website, and the first feeling that stroke me this time, when entering the Bag Factory gallery, was not only the excitement of finally seeing Pebo’s work ‘in the flesh’, its physical imposing presence, but the excitement of witnessing the amazing development of his work in the past few years. From the medium size prints he used to make a few years back, he has grown to work on very large canvasses; his long, conscious experimentation with repetitive mark-making has resulted in confident strokes, as much as his search for a personal “honest visual language” has indeed produced a coherent, bold artistic language, rich in symbolic representations of a variety of life experiences and personal struggles, as well as preoccupations with societal aspirations and problems, in particular with the impact that technology is having on communications and people’s lives. 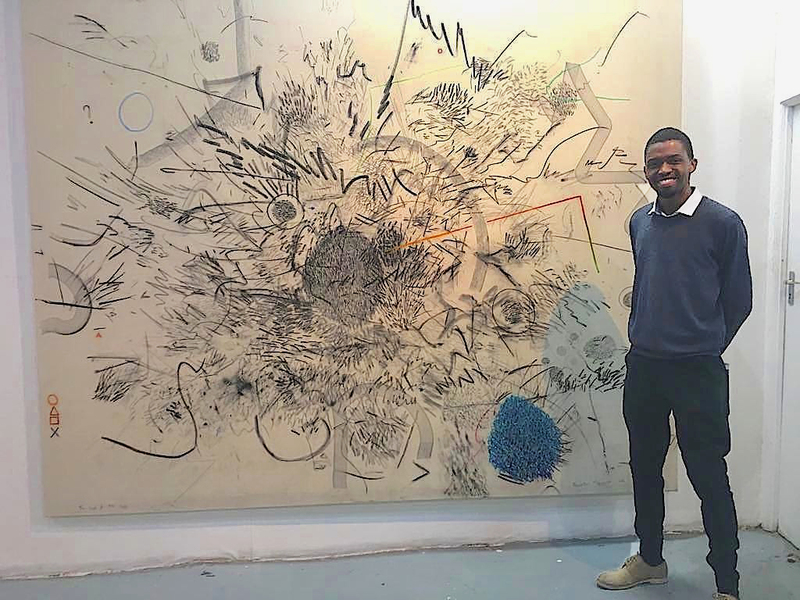 Pebo’s powerful words are embodied in the powerful new works he showed in this exhibition. Congratulations for your show, and thank you for your warm welcoming the opening night! 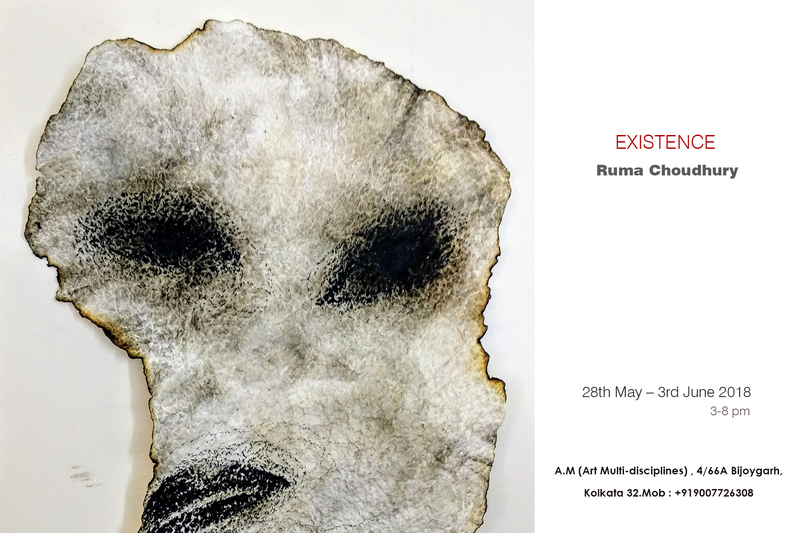 'EXISTENCE' is Ruma Choudhury's contribution to the Group Visual Arts Project 'RACONTEURS', which ended June 3rd, 2018, at the A.M. Studio in Kolkata, India. Here she addresses her close connection with Mother Nature and its importance to the well-being of society, who more often than not disregards and abuses it. I come from Dubrajpur, a small village in Birbhum. Dubrajpur for me is not only a place filled with nature and natural objects, with trees, plants, and flowers surrounding throughout. It is a space that speaks about my Existence as a human being, as an artist. It speaks of my journey from childhood to being an adult. By growing up in a place such as Dubrajpur I have memories, relations, and affection dependencies, which affected my life thoroughly. I have grown up seeing greenery all around me, with nature being my all-time companion. An unusual friendship grew between nature and me, which I became aware of as I grew up. I have always believed that the works of all visual artists are the reflection of those persons. Being one of them, this is the same for me. As I started working prior to my Art College days, I used more basic compositions, following conventional practices; but as I got to the depth of things, especially with the beginning of my Art College / Professional Art Training, I started finding the resemblances that my creations had with my early life experiences. 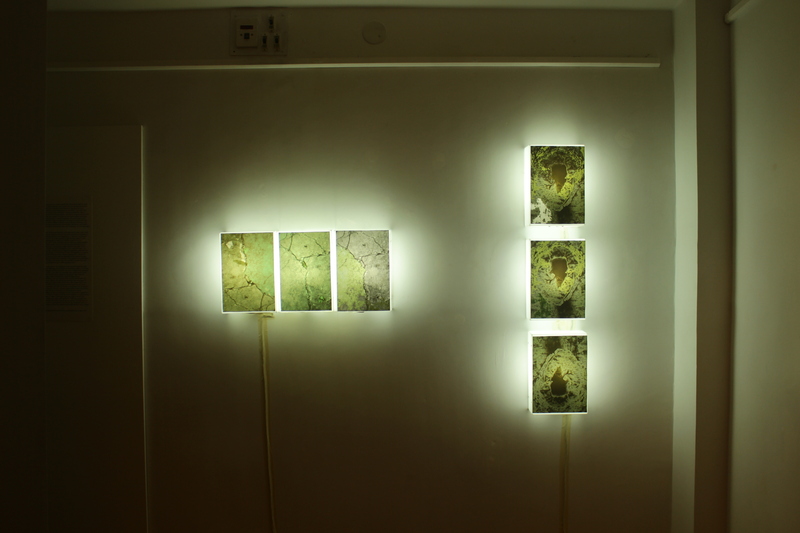 Thus, my works predominantly featured the different aspects of images of nature and natural objects. I was practicing on that line of work and had set my journey accordingly. Nature became the most important ingredient in my food for thought while creating my paintings. 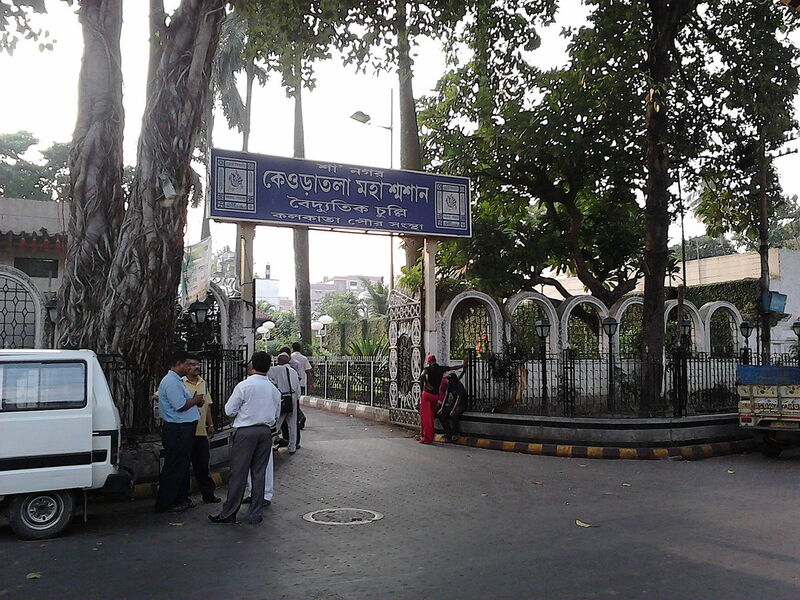 I shifted base from Birbhum to a larger metropolitan city, Kolkata, after my college life. With the shifting of base came a shifting of images. The effect of a busy city life took its toll on my creativity as well as on myself. I started facing a deep existential crisis regarding my self, my thoughts, and my experiences. I saw how the greenery of Mother Nature turned into the concrete jungle filled with human figures. Suddenly my inspiration faced a huge block, and I became creatively numb for a good amount of time. In the city life is fast, busy, and people rarely have the time to breathe freely and be aware of their surrounding and their affections. This was a rude awakening for me, as I saw people rarely give importance to or cared about natural objects and Mother Nature. This materialistic ways of thinking overlooked the actual reason of our existence. I saw people forget the reason why we exist on this planet; people who have totally forgotten about the fact that we exist because Mother Nature exists with us. We breathe because Mother Nature breathes with us. Our dependency on Mother Nature is completely forgotten and washed away from the minds of most people living in this metropolitan city. With utter sadness and mourning, I realized that like me, my best friend, Mother Nature, was also facing a crisis, and to be fair and existential crisis. As they rightly say, every human being’s life is a struggle: a struggle for existence, a struggle to survive and a struggle to express. As an artist, my journey took a new form with the introduction to city life. It took a lot of thoughts, realizations, and self-assessment for me to find and choose the right path to re-ignite my creative self. I made a few decisions for the sake of a smooth running through my art practice. Firstly, I tried to re-create the ambience in my house that was naturally available in Birbhum. I started gardening and planting extensively in the limited space that I had in my present home. Through this practice I again brought about the feeling of care for Mother Nature and this gave me huge mental satisfaction and happiness. A feeling of respecting the disrespected and caring for ‘the outcast’, filled my heart and mind with positivity, and it helped me in reenergizing myself to start afresh with my art practice. In my own way I wanted to give Mother Nature the importance and positive space that was missing in the city. I thought that, with me, Mother Nature could cope with the strong negativity of her existential crisis. I learned the art of papermaking in my college days; with the help of some of my teachers, I rigorously practiced papermaking and even successfully made paper from different plant fibers. This practice has been an important part of my art-making process since then. I re-introduced the art of paper making into my practice. I started composing and drawing on paper which I made with my own hands and doing different experiments, through the amalgamation of my drawing and art of papermaking. I tried to treat the surface as part of my drawing. Paper became part of my subject; the feeling of existential crisis in me and Mother Nature in this city helped me in thinking and conceptualizing this, as I tried to involve in my work the paper I made from natural fibers. I used fibers such as banana, tussar, sugarcane etc, in my final works and compositions. Thus, I involved nature into my works, not only on a mental and visual level, but on a practical level as well. Nature as I saw it, was un-caged by me and given back its rightful place again. As I continued with my art making process, I realized that the city life had affected my subjects as well. As I was drawing what I was seeing, human figures entered my compositions; I consciously let this happen as a reflection of my current mental state. I composed the similarities I found in the human body with nature, the physical resemblance which I could see and observe. I started composing the pain I could see in nature due to the lack of love and care it got from human beings: I wanted to speak for Mother Nature, who always takes the pain and agony but never retaliates. I wanted to express her anxiety through my works, as I depicted her pathos and pain from a human perspective. I tried to create images of Mother Nature crying out her agony just like we human beings do when we feel pain and different emotions. 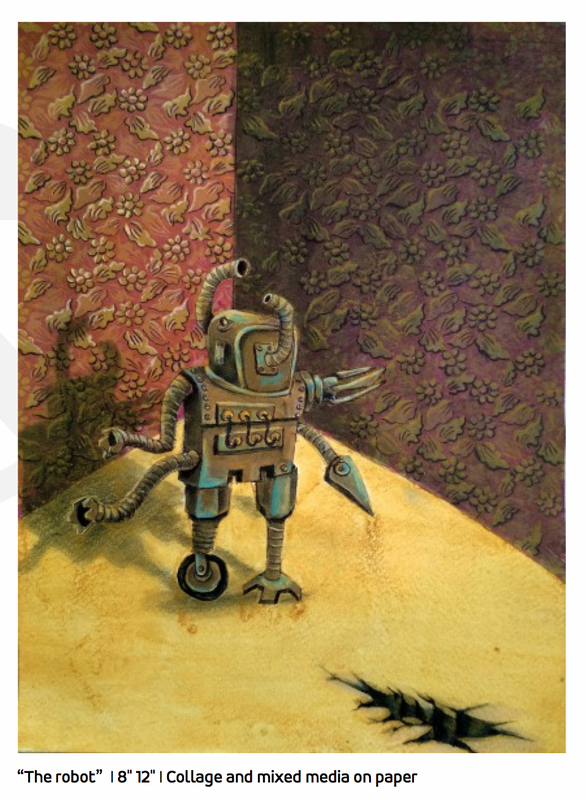 My works became a satire for nature and a metaphor for the human being perspective. 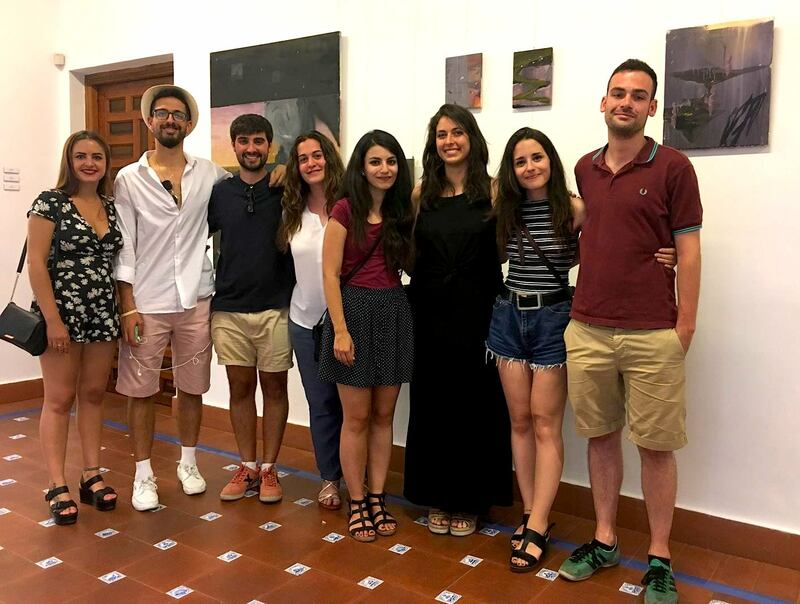 Six visual artists and six writers lived together for several months at the Antonio Gala Foundation Residency in Córdoba, Spain, where they were given the opportunity to work freely and share their creative experiences with each other. This year the residence lasted from October 2017 to May 2018 with 12 participants, six visual artists and six writers. 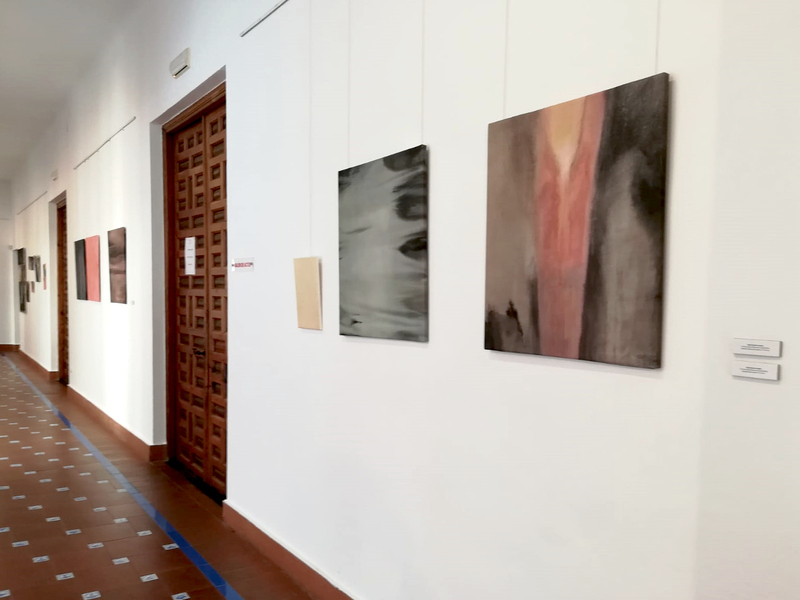 The projects carried out by the visual artists during these months were presented in an exhibition that opened in Cordoba from May 18th to June 15th. 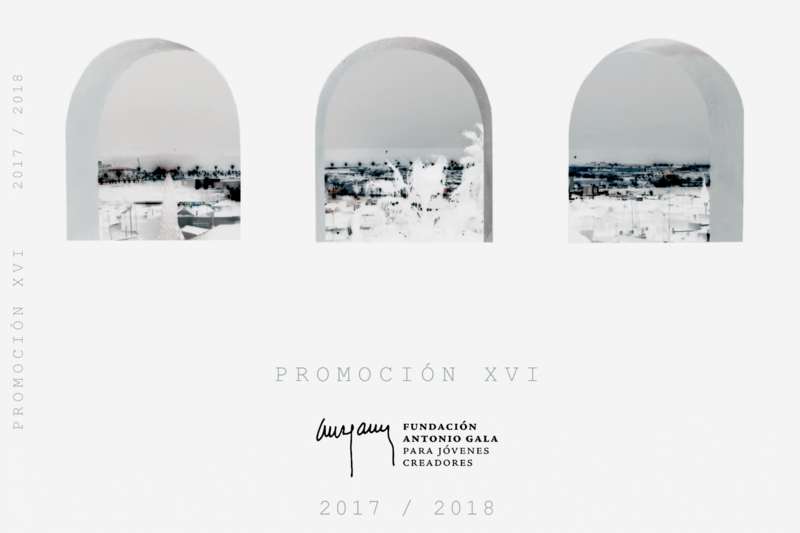 The same exhibition moved to Málaga on July 5 and will be up until July 26th, 2018. "La vida consiste en un incesante movimiento, cuya salvaje armonía es imposible que capten los cobardes. Consiste en un paisaje siempre desconocido y opulento e inabarcable, que excede las intenciones de los pacatos y los tristes. No seáis perdedores de antemano; no empecéis por ceder antes de la batalla. Rebelaos. Estáis llamados a la felicidad más alta: ser escritores, escultores, pintores, músicos, creadores en una palabra. No os conforméis con esa felicidad en calderilla que proporciona el atenerse a las humildes normas cotidianas, ellas sí complacientes y raídas… ¿Seguridad? Nada más inseguro que aquello que logra, de repente, hacer feliz el corazón humano. Gracias a la inseguridad progresa el hombre, descubre, inventa, explora, se mezcla con lo nuevo y se renueva él mismo (aquí en la Fundación, durante vuestra estancia, lo habéis podido comprobar). Lanzaos a la empresa más ardua: ser vosotros. ¿Qué meta os propondréis, en qué sentido vais a avanzar? Da igual: el mundo es infinito; la vida es infinita; cualquier seguridad es falsa y, de momento, no hay hogar. Todavía estáis en la hora de la peregrinación. Todavía estáis en esa hora en que el camino es mejor que la posada. Y espero y deseo que vuestro paso por esta casa, que ya es la vuestra, os ayude a hacerlo más llevadero. Y os insto, con pasión y con brío, a que seáis auténticos amigos. Y os ruego que seáis sinceros siempre, con una sinceridad profunda y nada parlanchina. Y, sobre todo, que seáis fieles cada cual a sí mismo, y leales con los otros. Para no fracasar, para crecer, antes que nada, es preciso conocer nuestros límites: dónde nos acabamos y hasta dónde conducen nuestros sueños. No decirnos en esto la verdad es traicionarnos y traicionarlo todo. Y os deseo que no os defraudéis a vosotros mismos nunca; que consigáis la felicidad ahora y después. Sobre la mentira no construyen la felicidad más que los ilusos y los necios... Aspirad a la altura; sed dúctiles y francos, pero sed duros si es preciso. Y sangrad siempre que sea imprescindible: la sangre se remoza. Ojalá lleguéis a ser como yo os imagino: fuertes y realistas, soñadores y fuertes. La felicidad a la que siempre he aspirado y que os deseo es la alta y honda satisfacción de saber quiénes queremos ser, y que lo estamos siendo, o que nos aproximamos más cada día a serlo (espero que a ello os haya ayudado vuestra estancia aquí). Y, sobre todo, no olvidéis vuestro paso por la Fundación, y por Córdoba, y recordad siempre su lema: pone me ut signaculum super coor tuum (ponme como una señalita sobre tu corazón). Hasta siempre. Tenedme con vosotros. Pero, aunque me olvidaseis, hasta siempre también." ‘Life consists of an incessant movement, whose wild harmony is impossible for cowards to grasp. It consists of a landscape always unknown and opulent and immeasurable, that exceeds the intentions of the pacatos and the sad ones. Do not be losers beforehand; do not start by giving up before the battle begins. Rebel. You are called to the highest happiness: to be writers, sculptors, painters, musicians, creators in a word. Do not settle for the happiness in change that provides the stick to the humble everyday norms, they are complacent and frayed … Security? Nothing more insecure than that which, suddenly, makes the human heart happy. Thanks to insecurity man progresses, discovers, invents, explores, mixes with the new and renews himself (here in the Foundation, during your stay, you have been able to prove this). Throw yourself to the most arduous company: be yourself. What goal will you propose, in what direction will you advance? It does not matter: the world is infinite; life is infinite; any security is false and, for now, there is no home. You are still at the time of pilgrimage. ‘ALCHEMICAL REACTIONS’ starts from the ancient practice of alchemy and experiments in the laboratory with elementary states of matter. The process combines analog photographic chemistry and pictorial techniques. The final images represent fictions of a magical world. Cosmological and geological inspiration through abstract shapes. Ana works with alternative photography and installation. She explores concepts from early science, astronomy and physical theories. She studied BA Design at the UFV University of Madrid (2010-2014), Personal Project and Photography in La Maquina after winning the annual grant-context of the school (2015) and a MA Fine Arts at the UCA Canterbury (2016-2017). Her pieces have been shown internationally in different cities in Spain, Italy, France, United Kingdom and Colombia. ‘CON-TEXTS’: In this line of research, Malek focuses on the "textual language" and is inspired by both current and historical poetic and political discourses, trying to reflect on their aesthetic side, on one hand, and on the other, to visualize the state of confusion, meditation and intimacy that the discourses provoke. He was looking for a motivation to embark on this path, and has found it reviewing his communicative baggage and in the experience of living for two years in a different country, another culture, another language and another context. 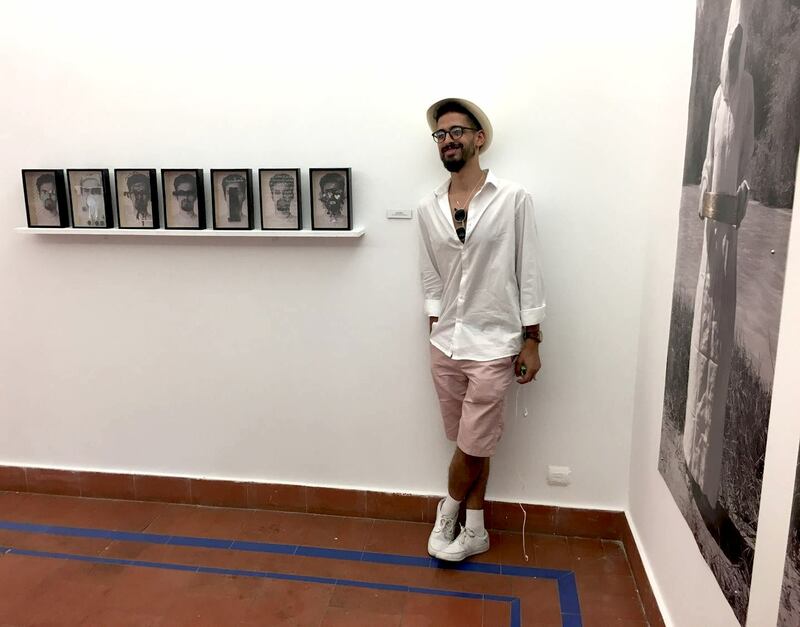 Malek is a Moroccan multidisciplinary visual artist who graduated in Fine Arts in Tetouan, Morocco, and earned a Master Degree of production and research in Granada, Spain. 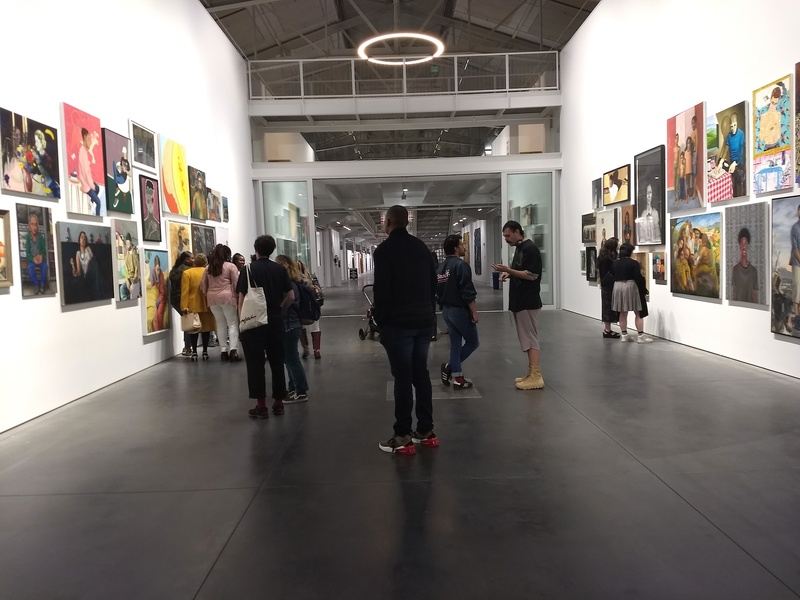 Between 2012 and 2018 his works were shown in several exhibitions in Morocco, Spain and Tunisia. 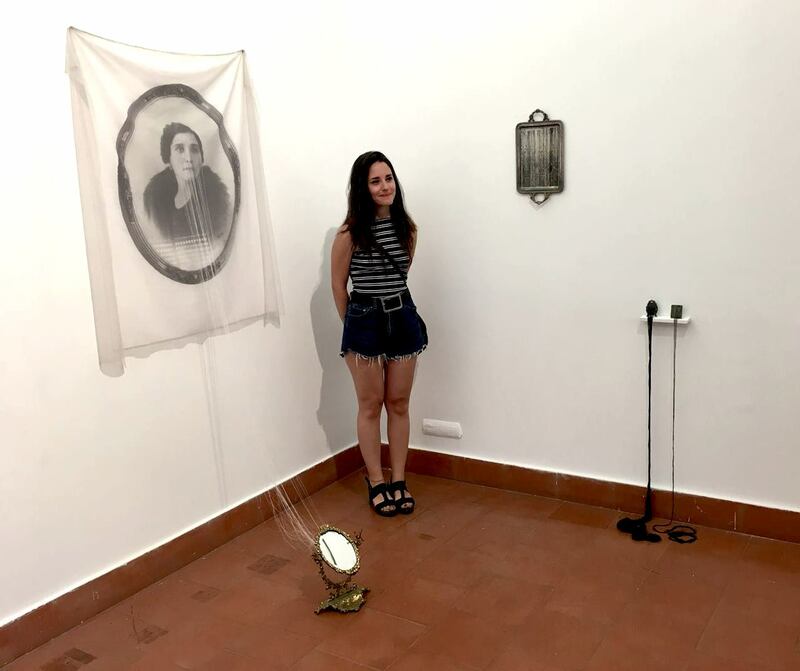 ‘DESVANE DE LA INFANCIA’ (Childhood attics) aims to explore the natal house and its familiar heritage through the accumulation and abandonment of objects. It works with antique, old and marginal objects, analysing their meanings which look back on a period, an essence or a person, becoming memory agents and “experience carriers”. The installation creates a “Scenography of oblivion”, aiming to awake sleeping memories and extracting subjective experiences from the domestic space. 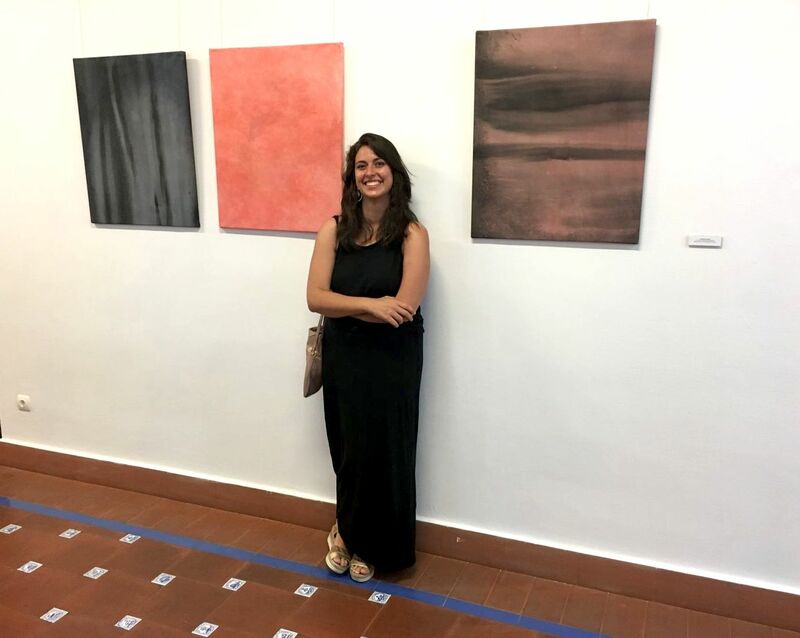 Alsira received her Master’s in artistic production from the Technical University of Valencia, Spain, and a Bachelor’s Degree in Fine Arts from the University of Salamanca, Spain. 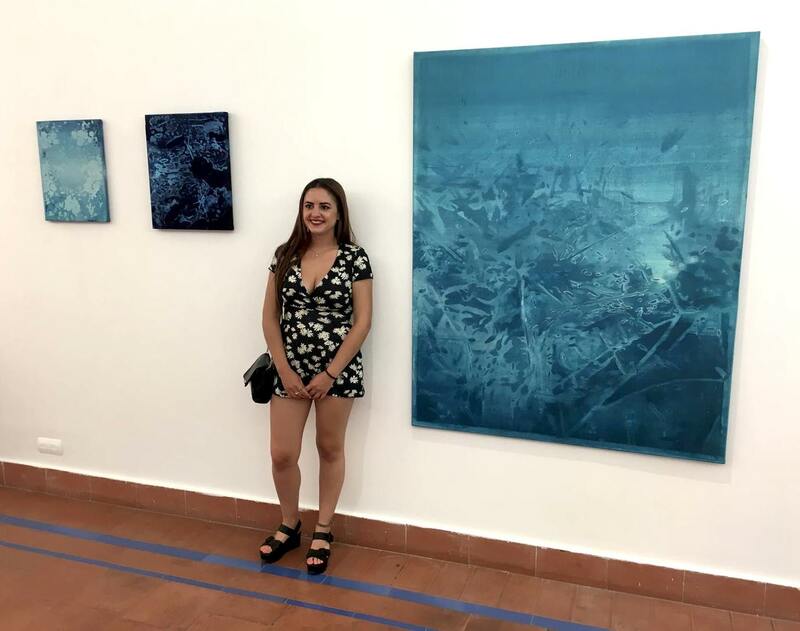 She participated in exhibitions such as, the 17th Selection of J.A.C.A., ABM confecciones in Madrid (2017), VILLALART Selection in Valladolid (2017), the 10th Selection of Edi-Setó Jove 2017 through Fundació Setba in Barcelona (2017), and the Arts Libris Fair through Arts Santa Mònica in Barcelona (2016). The pictorial series ‘THE NEAR AND THE UNKNOWN’ depicts a set of enigmatic landscapes through motifs that evoke the natural. The title of this project alludes to the idea of the uncanny of Freud, which is materialized by ambiguous images where the limits between the real and the fictional are blurred, where the known gives way to the strange. Sheila received a Bachelor’s of Fine Arts from the University of Malaga. During her career she had study periods in the University of Salamanca through the Seneca Mobility Grant and in London through the MEC Mobility Grant. In 2014 she finished the Master’s of Research in Art and Creation at the Complutense University of Madrid. 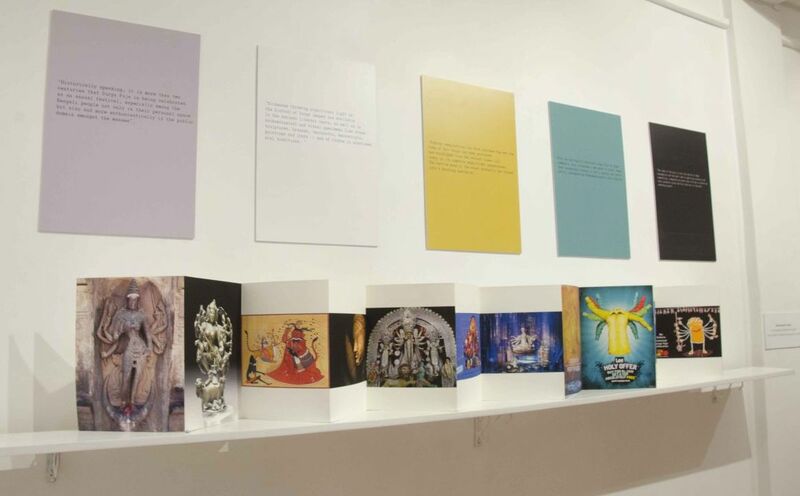 Her work has been exhibited nationally in cities such as Malaga, Madrid, Cordoba, Ourense and Salamanca, as well as internationally in Kolkata, India. 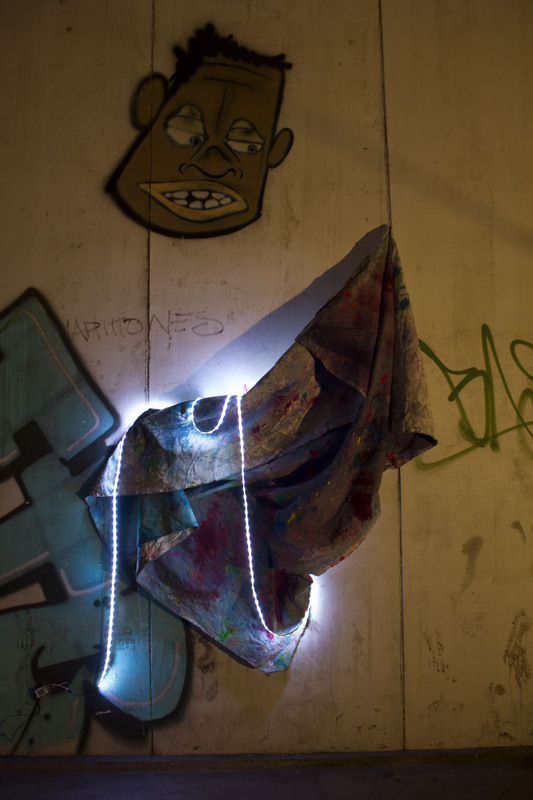 ‘INFECUNDA MURALLA’ (Infertile Wall): Through this pictorial project a deep search has been developed around imaginary and intangible spaces that move away from a specific time or place, projecting an uncertainty about what they suggest and show. Thus, timeless atmospheres perpetrate the daydream and mystery as a way of visual representation. Paula has studied Engraving and Printing Techniques at Cádiz Art School and graduated in Fine Arts from University of Sevilla. 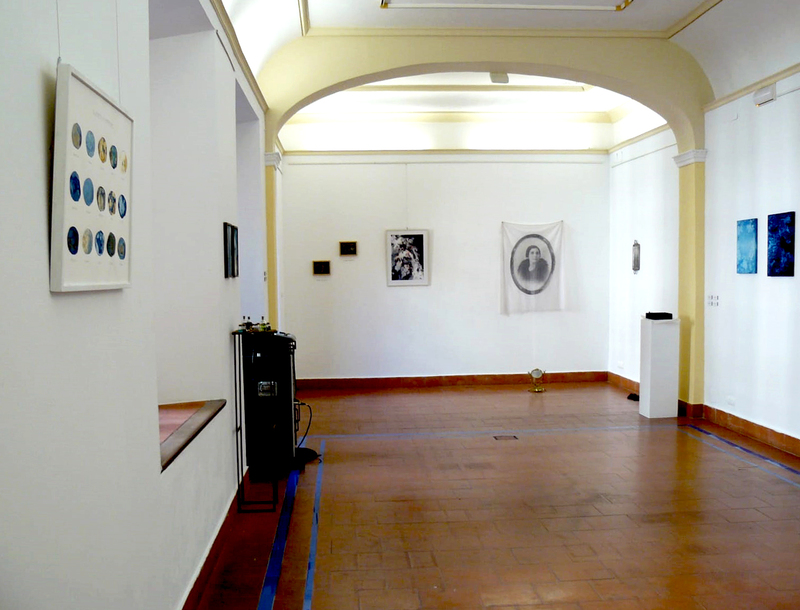 She has participated in many collective exhibitions, such as ‘Deslocalizados II’ (Sevilla, 2017), ‘XI Creación Joven de Sevilla’ (2016) and ‘Algo más alegre III’ (Sevilla, 2016). Her photographic series ‘Paisajes Cerrados’ was selected and published in Género y Figura website (2016). The action painting lives in surface as if it were his territory to be able to grow, like a sensitive organism that mutates to completion. Tinted liquids flow and leave their trail receiving the impact of solid paint forming heavy scabs. Strong lines split the air radically. Lights jump from a piece to another courting a dialogue between them. The daily space is distorted to remind perception deliriums or disorientation between being and place like it may happen in dreams. Gabriel graduated with a Bachelor’s in Art at the University of the Basque Country in 2017. In 2011 he participated in the mural project "Colors" between Cantabria and Cádiz. In 2012 he completed a graphic design course at Imval in Bilbao. In 2016 he obtained the scholarship of landscape "Course of Pensioned Painters of the Quintanar Palace" in Segovia. 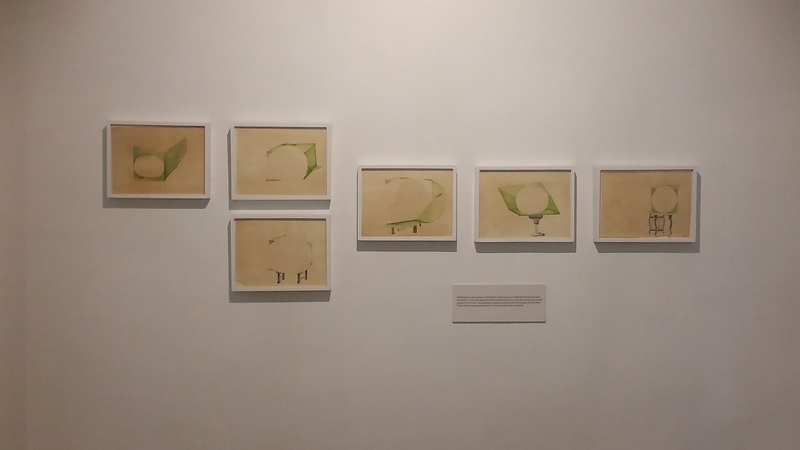 He participated in the collective exhibition "Cricket Soup" in Portalea, Eibar from 2015 to 2016 and in 2017 he exhibited at the General Meetings of Bizkaia (Bilbao) and at the Sala Rúas (Laredo). 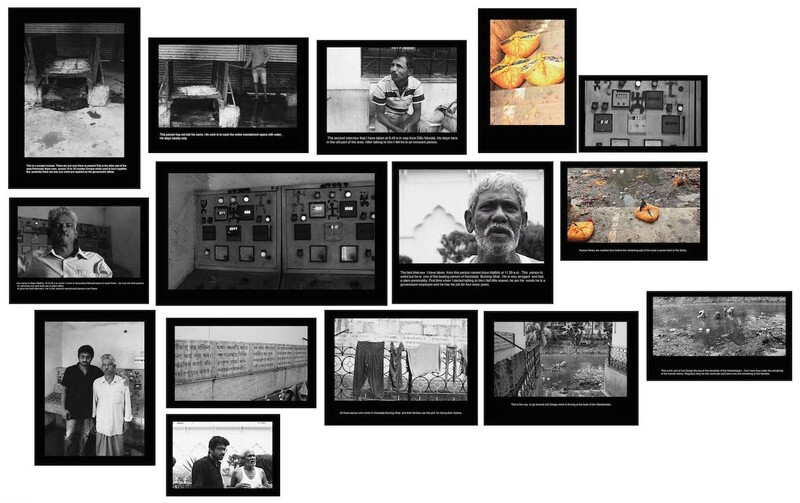 'SYNAESTHESIS' is Prasanta Ghosh's contribution to the Group Visual Arts Project 'RACONTEURS', which recently ended at the A.M. Studio in Kolkata, India. Here he addresses death in relation to privacy, or the loss-there-of, and the life of those whose job is to deal with death on a daily basis. In this work I have developed a story by translating my experiences, personal encounters and incidents going down the memory lanes. This work is a reflection of an incident, which I encountered personally. At that point in time many questions were in my mind: as soon as people die, do they lose all their privacy? Or does anybody get permission to access their privacy? I do not believe in the life after death, but the person standing beside me may believe in it. This work can therefore also be seen as the reflection of the thoughts of the person beside me. The source of this work is a personal experience in a crematorium. Some days back one of my relatives passed away. We took her to the crematorium. There she was laid down on a wooden panel, which is commonly used. In the next step, her corpse would be put inside the furnace. Experiencing the details of this event left a huge impact in my mind. This relative of mine was a private person. Her privacy was protected within the boundaries of her family. But on that fateful day, her husband was lamenting and disclosing many private memories regarding her life in front of all those who were present at the crematorium. I was staring at him blankly and could not even utter a single word. Then suddenly something stroke my mind, and I was wondering if just because she was dead, her privacy was there no more? I have conceptualized the story as the thought of the person next to me who believes in life after death. The word ‘PRIVACY’ is used here in the context that whatever the dead people are doing after their death, nothing is concealed of their private lives, which seemed to happen when they were alive. Maybe after death the reconstruction of their lives changes, and a new series of life seems to develop. In this story it is seen that the dead people have got the license to go anywhere in between people and in their private space. Who takes care of dead bodies? I believe that walking through a crematorium is really a tough thing to do for each and every human being. Throughout the air is always a heavy hearted feeling. I think that this is the only place where no humans will come by their choice. But is this true for everyone? I don’t think so. There are many such people among us who go there by choice and do all the needful duties that a crematorium requires, in spite of being marginalized from the so called ‘civilized society’. I went to Keoratala crematorium the day I was working on my book ‘Dead people does not have any privacy…’ in order to explore the place more, and to meet the people who work there. While talking to the crematorium workers, I found that many of the things I felt are really ‘unsaid’, not spoken of. I asked some questions to them, to understand the psychological aspect of that job, but when they replied to my questions I became aware of many more things which I felt were important. I asked whether dealing regularly with so many dead bodies affected their mind, and I was surprised to hear their answer, that except in particular cases, the dead bodies do no affect them. They are habituated to regularly deal with it, and the dead bodies have become non-living objects for them. They spoke about the history of the place, spoke about their job, spoke about their identity and how this identity distinguishes and separates them from the so called ‘civilized society’. They spoke about their families, spoke about their activities of regular life. I think that many of us in our society are unaware of the things that the crematorium workers talked about, of the words that they spoke. Maybe people do not take interest in their lives as they are marginalized from the rest of society and are considered in the same category as that of the stray animal on the road. On hearing the words of Raju Mallick, who said that they do not have any emotions left with them and everything has dried out from within their soul, I realized that they would like to live a normal life, but they are bound by their duties. Sometimes I wonder if they are really living, or being bound by society to live as they do, with constant burning smell all around. Some of them see this work as their needful duty, but for some it has become a curse of their life. After our conversations I realized how strange that those people who used to curse them while living, those same people are being handled by them when they are dead. 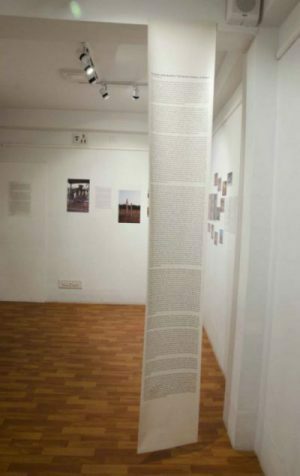 'Inscriptions' is Soma Bhowmik's contribution to the Group Visual Arts Project 'RACONTEURS', currently taking place at the A.M. Studio in Kolkata, India. As an art critic and art historian, she compares here the production of texts to the production of visual works, and in a very interesting reversal of roles, instead of using written texts in order to explain visual works, she uses images in support of the written texts. The main idea of this show is to attempt at showcasing various categories of texts that emerged in the course of my practice as a curator, art-critic and art-historian. And through these texts I wish to convey the process and the procedure followed to reach an understanding of the projects which are entirely visual as its main content. Visual artists play with multiple layers of explorations and experiments before reaching the final execution. Theoretical process too follows exactly a similar path before arriving at a convincing stage. That is one of the reasons why we tried to share the process of curating any show by displaying the layout or plan directly. In this show display of supporting images related to particular articles tries to explain the various texts; it may be a research-thesis or a review or article. By creating variations in the display of the text-image materials we have tried to create an ambience with a visual approach. Simply speaking, we wanted to make the textual matter a part of the visual ambience. I believe an art historian should always practice some practical works to understand the visual language very intensely. It is true that visual communication has directness; but when one writes a text other visuals and references also get evoked, thus enriching our experience of formulating a text. Communication is vital to any material always. 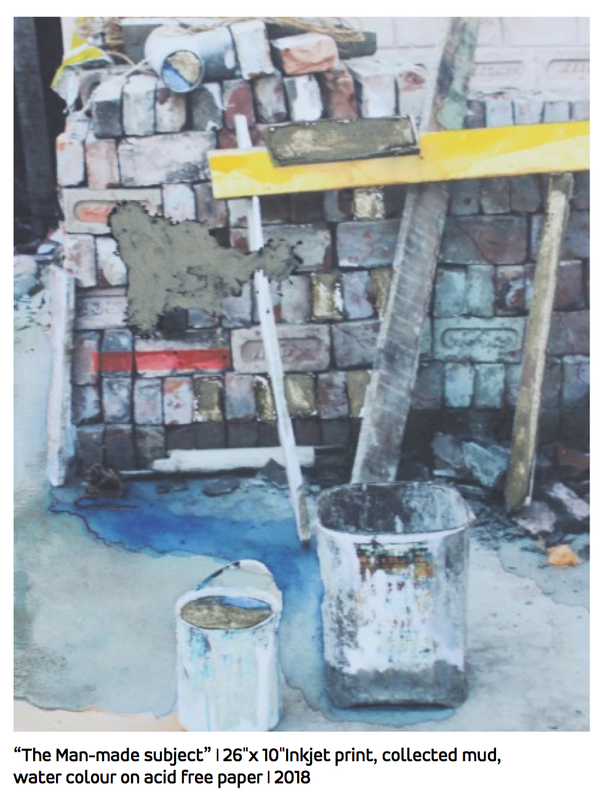 'Defining Relative Space' is Jayeti Battacharya's contribution to the Group Visual Arts Project 'RACONTEURS', currently taking place at the A.M. Studio in Kolkata, India. She addresses here the concept of 'home', charged with connotations and references to both physical and psychological realities. ‘Home’ is a multidimensional concept and acknowledges for the presence and need for multidisciplinary research in the field. It raises the question whether home is a place, a set of feelings, practices, or an active state of ‘being in the world’. While memories of home are often nostalgic and sentimental, home is not simply recalled or experienced in positive ways. Home centrally touches our personal life. In this set of works about ‘home’, structure, space, time, object, boundaries, and restrictions play a vital role. Fragmentation of known space, fragmentation of known objects, and how, with time, these objects fade away from us, play a vital role in my work. Sometimes the questions arises to my mind, ‘Is home a place, a space, feelings, practices, or an active state of being in the world?’ It is variously described as conflated with or related to house, family, heaven, self, gender, and journey. The fragile human life leaves certain sensitivities behind, captive inside the concrete structure of our private space. We live in the so-called concrete life with structured objects and structured spaces binding our limitations. I feel sometimes that when our presence fades away, our senses remain embedded in these concrete structures, and in the process of time these objects also desaturate our presence. Embracing the memories and spaces that hold the origin of my personal identity is reflected in these works. Revisiting the past through memory lane and reconstructing the privacy through the world of uncanny imaginations seems to be happening over here again. The thoughts and images are collaged in the same plane to form a meaningful shape of it. 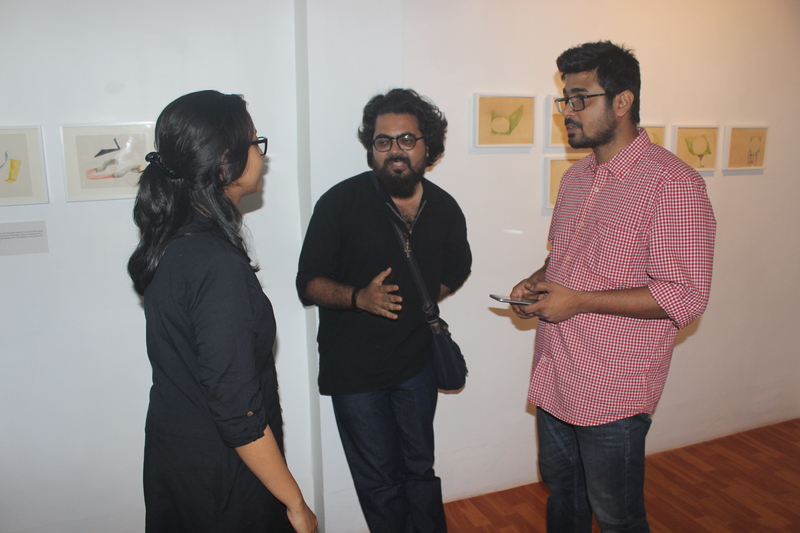 Jayeti Battacharya, left, with two friends at the opening of her show. While being in the process of work, I feel like a virtuous space is created within my work with the objects of real space around me, and these objects carry the experience of their regular life, and how they develop an intimate relationship with humans around them. In this series I worked mainly with the known objects of my personal space, using my home and the mud collected from within the boundary of my house. The mud creates a relation of my land roots to the space where I grew up. My work revolves around the questions of how the private space is affected by social norms and how our presence fades away from these objects over the passage of time. 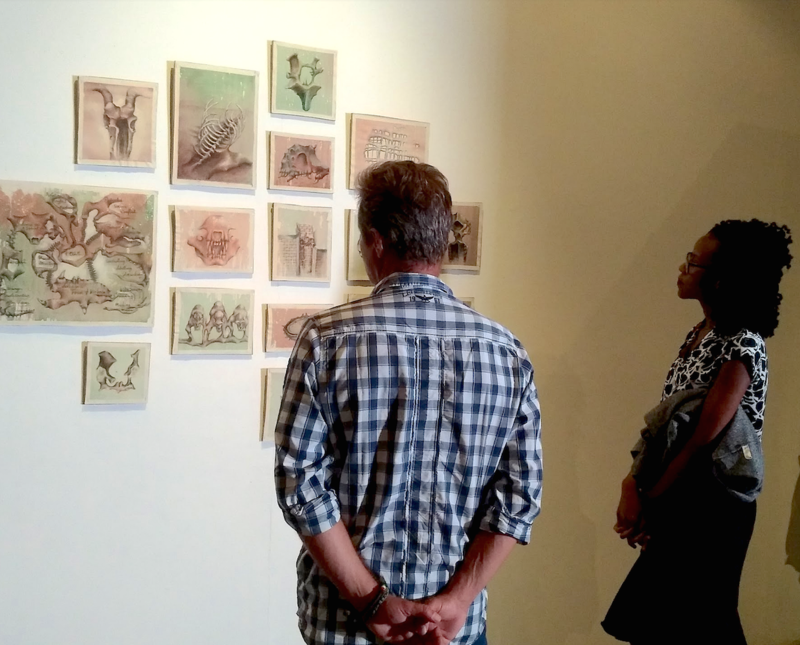 A visitor looking at 'Severence' on the opening night. A relation without bindings, a relation without any compulsion, a relation of no charms, a relation of equality plays a vital role here. These sentiments are important in the growing up years of every human mind. I feel somehow we are losing the essence of life in today’s work. Displacement does occur with time. It is the thought that kept coming to my mind while doing this series of work. Whether it is displacement of thought, physical displacement or emotional displacement, each of it is related to the growth of time and space around which we live. 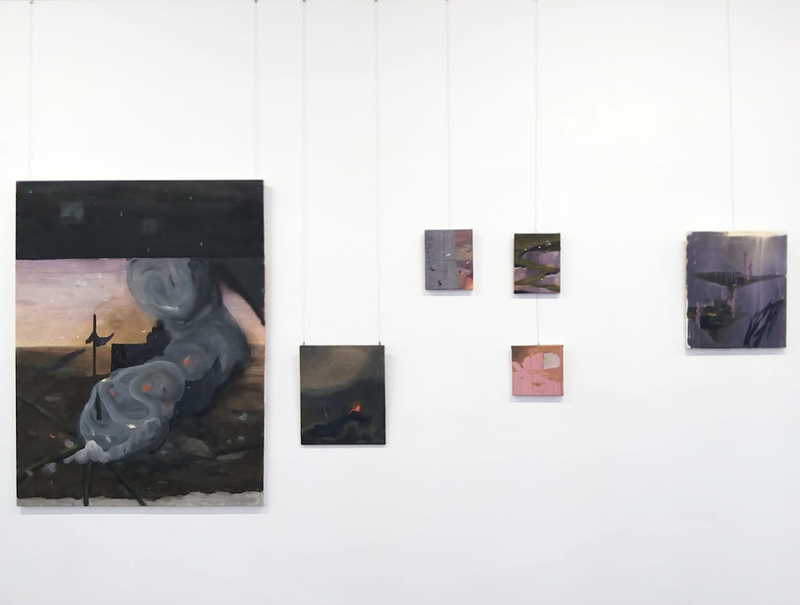 Forty-three Master of Fine Arts students of the California College of the Arts presented their theses (paintings, photographs, illustrations, installations, and sculpture), at the Minnesota Project in San Francisco. 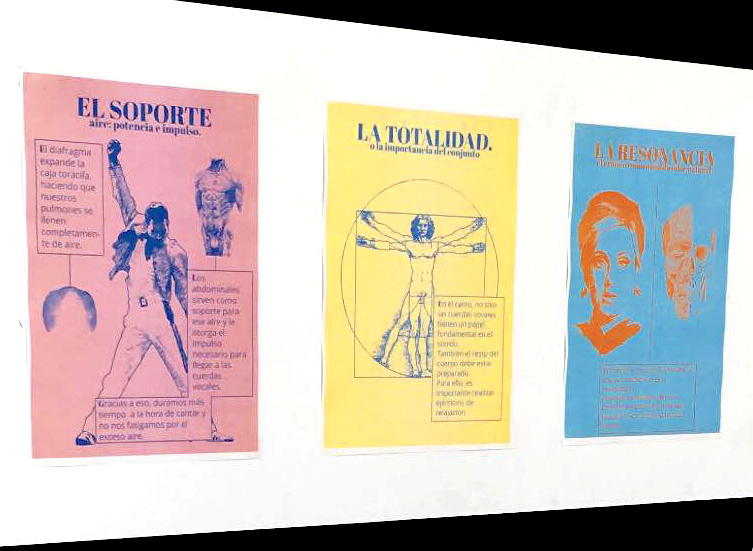 Unlike typical gallery showings, where one artist’s work fills an entire room, the CCA theses were presented six to eight pieces per space. As a result, the experience of the viewers is not limited to their intake of one artist’s creation, perspective, and portrayal. Each piece had an individual purpose, question, or presence, but the most interesting part of the show was their cohesive interaction. 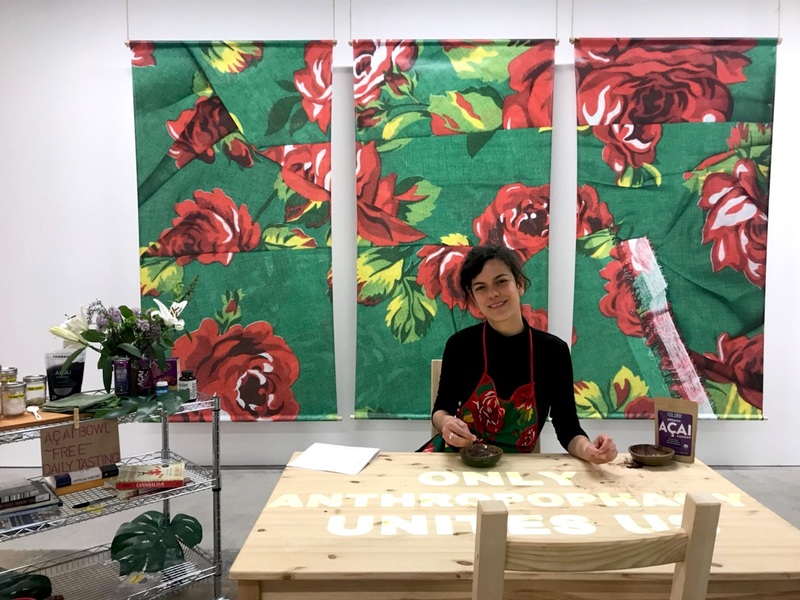 CCA thesis student Beatriz Escobar’s piece extends beyond the vibrant floral backdrop, the table lit with projected marquee phrases, and the rolling metal cart of food, books, and other supplies. The whole of the piece is set up for the interaction of the audiences within the space she has created to facilitate communication. Across the table, Beatriz then has a one-on-one conversation with visitors about how they relate and interact with other cultures. Her analysis originates in the concept of “anthropophagy”, a familiar concept in the Brazilian tradition, which refers to cultural creations as a result of appropriation, consumption and remixing of the creations and inspirations from other cultures, as in a kind of metaphorical cannibalism. Beatriz Escobar as a part of her showcased work, presenting an acai bowl to an audience. Beatriz explores this idea in reference to the actual consumption of food, as well as of cultural products which are often redefined and marketed. She explores the “consumption of the exotic other,” through acai, Brazilian native berries categorized as a 'superfood', but containing the same amount of antioxidants as blueberries. The setting itself and prompts of “acai bowls” encourage the initial connection with the viewer. As part of the piece, Beatriz uses her insights, acknowledging her own bias as a Brazilian woman living in the Bay Area, California, to create an acai bowl to appeal to the palette of her participant, while he or she reads a passage detailing anthropophagy out loud. Here, the viewer becomes a less passive member of a wider audience, he or she becomes a contributor to the art. The reactions and responses throughout the entire process cycle back to Beatriz and she too is part of the growing and developing conversation. Orange slated backing of Jennifer Brandel's installation containing 25 booklets of hand selected written observations. Beatriz pushes the audience to confront their privilege, judgement, and understanding of others within an enclosed gallery space. In a similar space upstairs, MFA student Jennifer Brandel challenges the walls of the gallery through a different personal journey. Jennifer exhibited a mixed media installation called Nimesiscape. A wooden frame--planked orange backing for twenty-five square papers--rises over viewers’ heads. While the physical creation is a collection of samples from nature, square perforated papers, vertically mapping a recreation of the outdoor space, with a compilation of observations, along with the process and methodology of getting it there, completes the art. 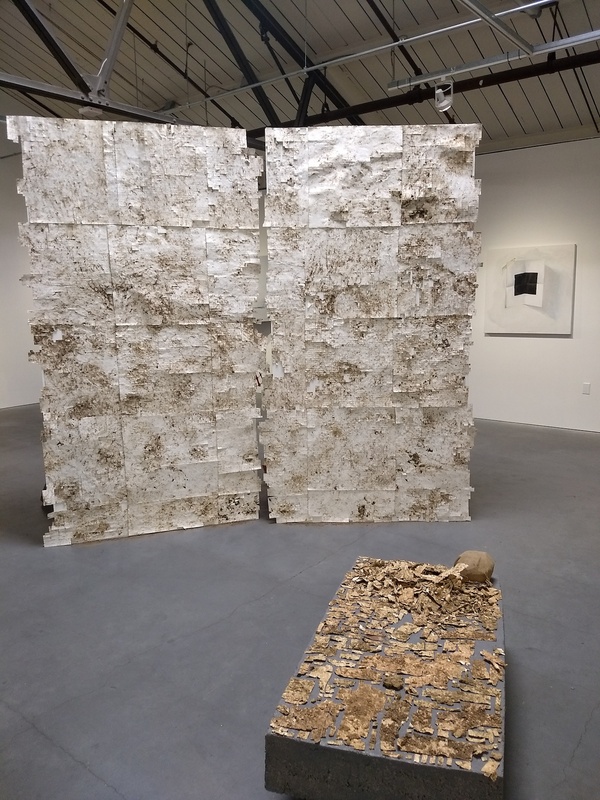 After a period of time, she dug up the paper, taking care to preserve the samples of earth that had collected, and recreated the terrain in the vertical piece that is presented in the gallery. Front view of Jennifer Brandel's collection of 25 perforated paper samples inserted and then removed from the ground in a California National Park. Importantly, Jennifer maintained a one-to-one scale in her twenty-five square unit, displaced terrain installation and created a corresponding map. In order to further the audience’s immersion, Jennifer also catalogued her chosen observations and experiences in the booklets placed on the back of the vertical piece. The process of choosing what content to capture in writing for the piece was also very intentional. She compiled voice recordings from each site visit which she then broke down, categorized, and copied by hand. Writing and mapping, along with the visual and physical presence of the large sculptural piece, collaborate to appeal to each of the senses. Acknowledging that one cannot know something without being there, Jennifer sought to recreate her outdoor experience for the gallery audience. By means of these components, the original space within the national state park which Jennifer catalogued, organized, and restored, presents questions about human nature--the desire to create structure and to preserve, as well as what comprises a commodity. 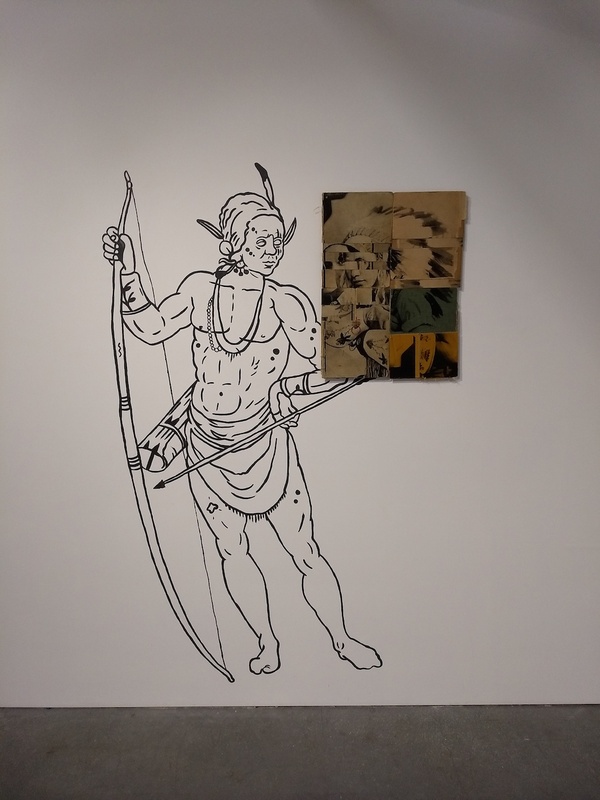 Keith Secola, black and white misrepresentation of the savage native contrasted with collection of visual artifacts from his own family history. While creating her piece, Jennifer was analyzing the living cycles of consumption and destruction. 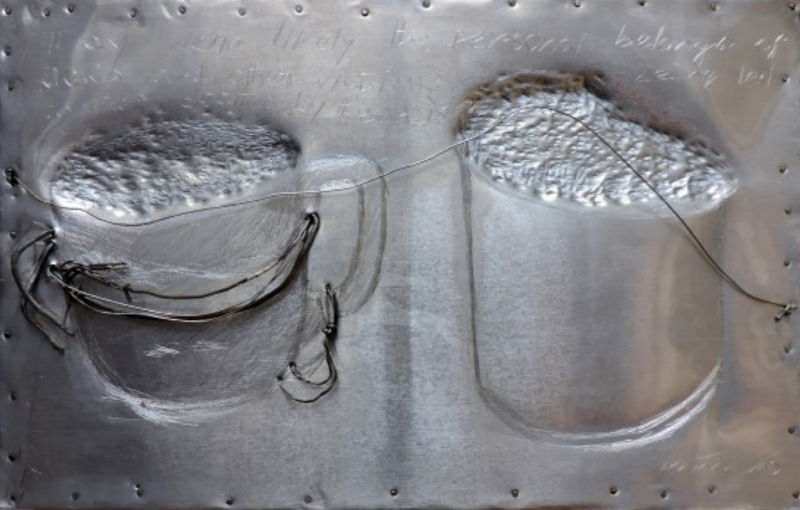 By presenting a tangible and proximate interaction, she encourages viewers to do the same as participants of the work. 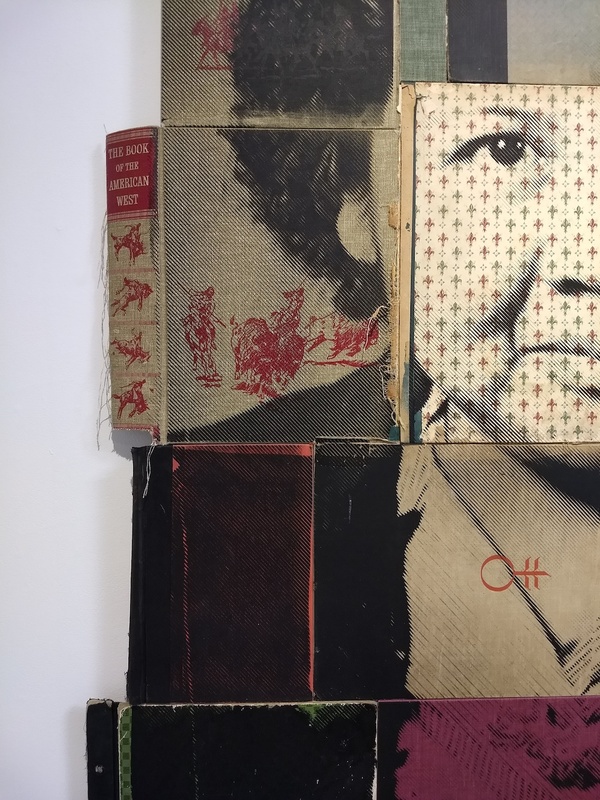 Close up of Keith Secola's collage of family photos and reclaimed book covers. Once again, the audience is presented with an external and internal view, the external being the Western stereotype that is marketed, and the internal being the real facts and stories of the people. 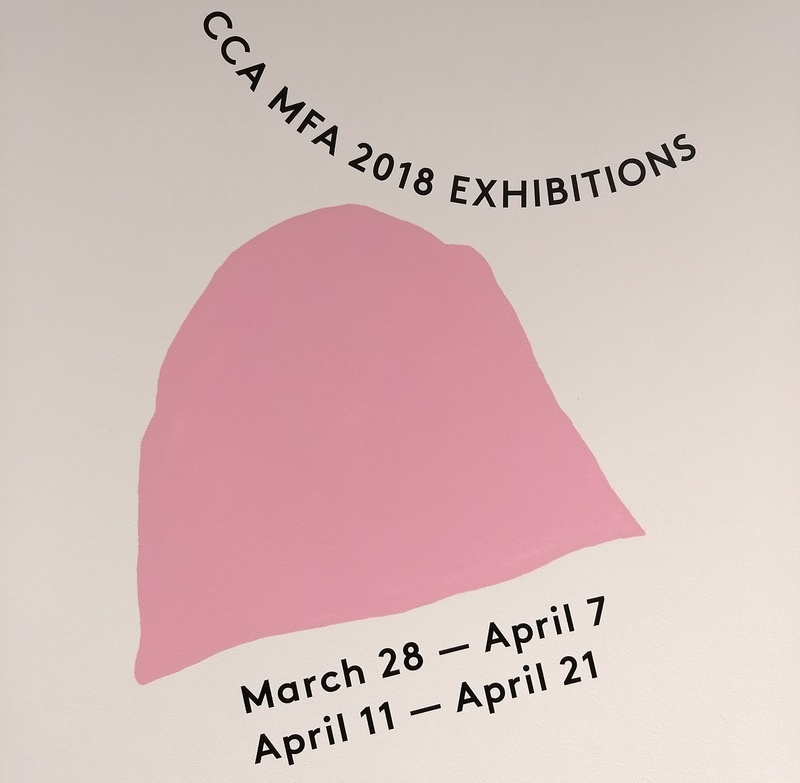 All three artists--much like the other forty CCA students who presented their MFA theses at the Minnesota Street Project--extend their creativity, passion, and curiosity to their audience. Jennifer’s faith in the open mindedness and design thinking capacity that artists often possess is exactly why “artists can save the world” in collaboration with experts from other fields. 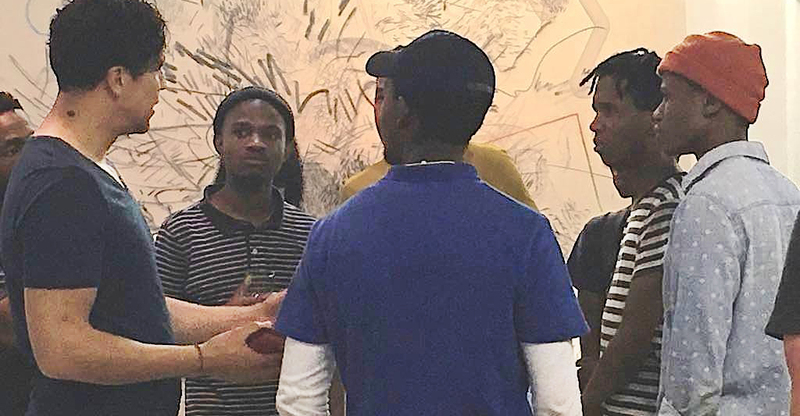 By opening conversations, these students demonstrate art’s potential to inspire discussion, redefine misconceptions, and analyze within as well as outside oneself. The Minnesota Street Project is situated in the Dogpatch district of San Francisco. community destination in synergy with the Silicon Valley technology hub central to the region. 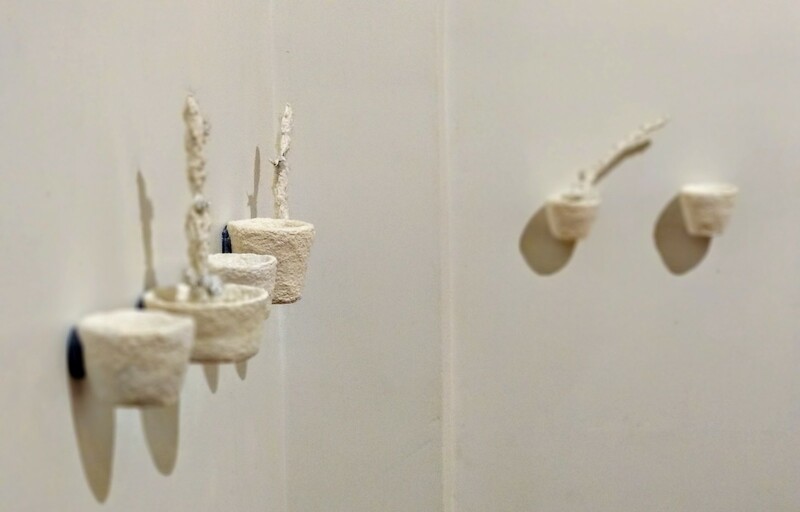 A few glimpses into the Art Department of the University of Sevilla, Spain, where some students, who participated in the first phase of the project 'Design Thinking in Higher Education', are showing their works. The Center for Cultural Initiatives, University of Sevilla, hosted a 'showroom' at the conclusion of the first phase of the pioneering educational innovation project 'Design Thinking in Higher Education'. The project has been funded under the 'Own Teaching Plan' of the University of Sevilla and is being carried out during this academic year, 2017-2018. 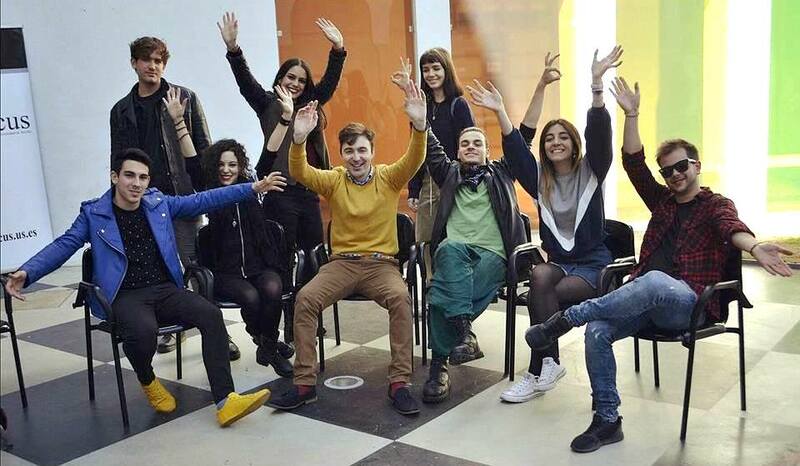 Nearly five hundred students, of which forty are international students on the Erasmus scholarship, from twelve different nationalities, participated in the interdisciplinary project, which involved professors in the fields of linguistics, pedagogy, engineering, building, fine arts and communication. On the day of the 'Showroom' 40 different academic initiatives, made by teams of students, were presented by their authors In various formats: oral presentations as 'TED Talk moments', videos, posters, and works of visual art. Ramon Blanco Barrera (center) with some of his students on the day of the exhibition. #DTshowUS (Design Thinking Show, University of Seville) has been an amazing event where students and professors from the University of Sevilla joined together to show their works, but also to learn about and to experience the various art projects presented. It was the culmination of a long process of hard work, and a beautiful experience. We encourage artists, students and professors from all over the world to jump, fly and dream about their projects. Because when any human being is inspired and motivated by his/her passion, everything is possible and a better world can be a reality. We, as society, can do better, so let’s do it!" ‘Souvenirs d'un autre monde’ is a song that inspired this project. This song immerses us in nature and new enviromnments, which I have always been very in-tune with. The artworks belong to a peronal diary that is still unfinished and evolving. I would like to thank 233 (Ramon Blanco-Barrera) for offering me the opportunity to exhibit. Without him, it would not have been possible. 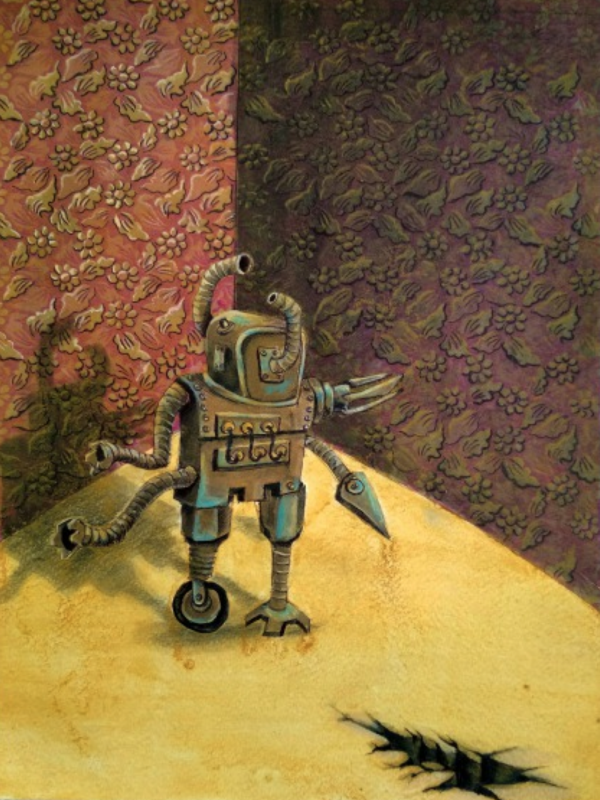 "Involution" consists of an anatomical investigation that precedes a book on which I'm working on, and whose characters evolve in both Mars and a postnuclear Earth. This investigation takes part in an ambitious project which is based on science, imagination and psychology, wanting to break molds and shapes that tie us down and force us to disengage our minds from several different branches of knowledge we are not specialized in. 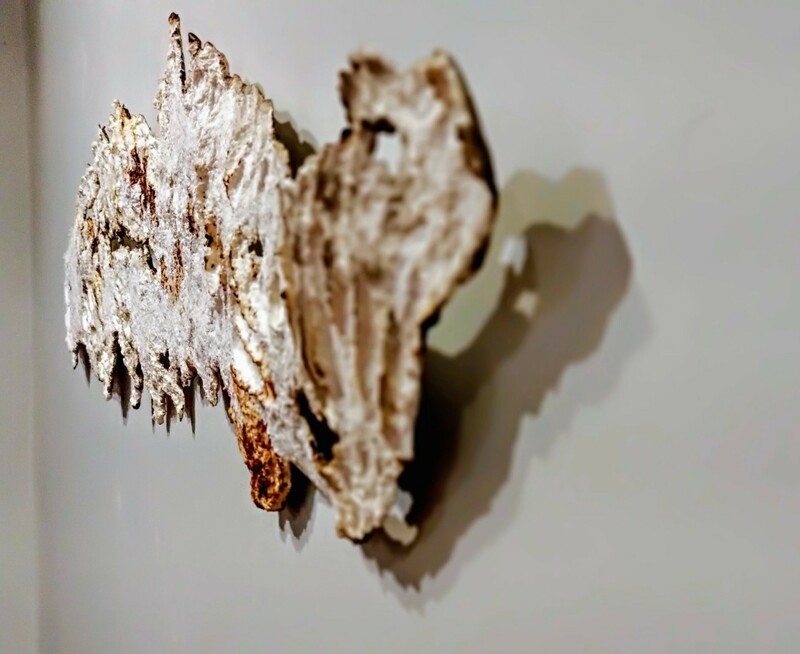 Artist and Youtuber, Laura Rastrollo's project for this exhibition is a small work made with recycled materials, 'Rehusilla'. The interviews to her fellow artist companions on their experience with 'Design Thinking' are also her contribution. To watch all of the interviews click here. "Anatomía musical" is a three‑part Project that puts together human anatomy and music. The posters – on the photo ‑ show the most important body parts when singing. Later, in a talk, a comparison between song‑writing and the human body is made. Finally, there is a performance of an original song that puts into practice the concepts shown on the posters. 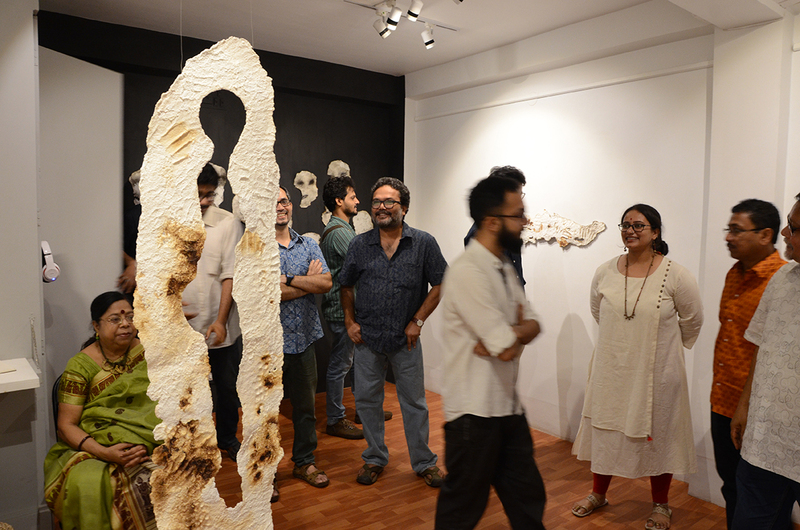 Several artists who took part in the international exhibition 'Translations - Kolkata', which was curated by Samindranath Majumdar in collaboration with Emergent Art Space in 2016, were reunited again in 'Still Life & Beyond', which was shown at the Academy of Fine Arts in Kolkata, between the 23rd and the 29th of January, 2018. Abhijit Alder, Arpan Ghosh, Aryama Pal, Debajyoti Das, Debashri Gupta, Jayeti Bhattacharaya, Mithun Das, Prasanta Ghosh, Sampurna Naskar, Sumit Sarkar and Suresh Kumar Singha explored for this show what lies beyond the still life painting genre, the infinite possibilities of figurative art that moves beyond representation, exploring the metaphorical, the symbolic, and the tensions inherent in every representation of reality. "it is the word 'beyond' in the exhibition title that opens up a space of interesting and enigmatic possibilities.... There is no attempt whatsoever to paint objects carefully composed on a tabletop with lustrous folds of drapery in the background; in other words, there is no discernible loyalty to what is still ideally considered to be still life in the strict academic sense... In the aspect of teaching, art still has a colonial hangover. 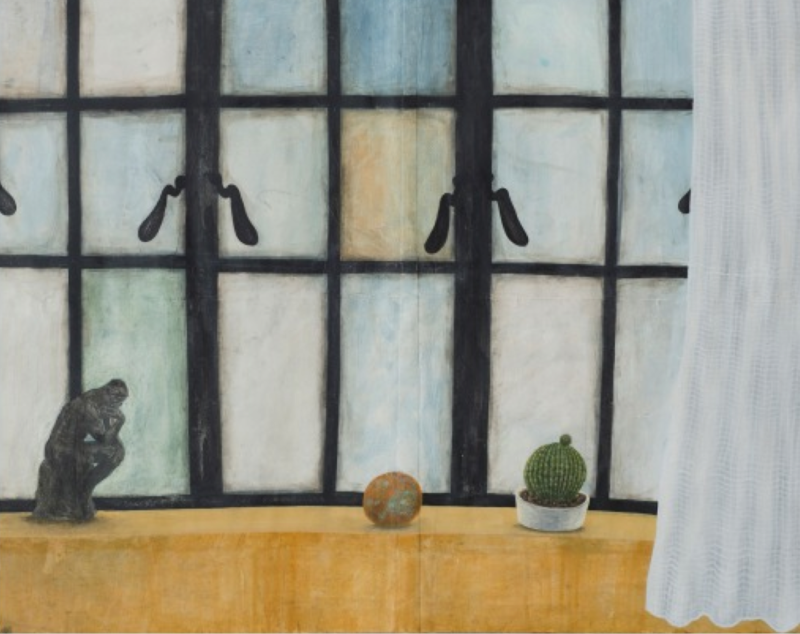 Before the British, people used to paint from imagination and memory, but the British taught us to paint by seeing and copying, and that has remained...The young artists [in this exhibition] have taken the autonomy to build narratives of their own by arranging, creating and composing forms as signifiers. An undernote of unmistakable contemporaneity is discernibly present in all the works, with all the directional pluralities that our times have opened up for us." 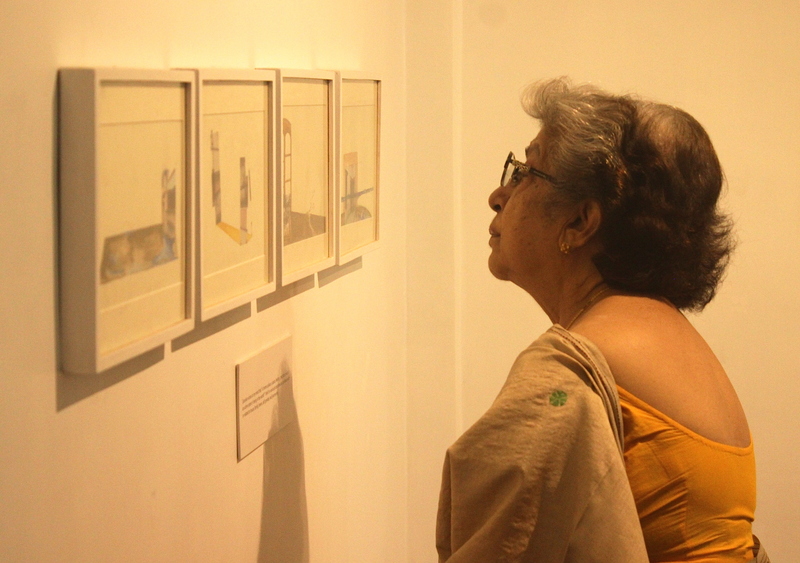 Samindranath curated 'Still Life & Beyond' exhibiting the works by his former students, and in turn dedicated it to his former teacher, Sri Partha Pratim Deb, In a meaningful gesture that not only reminds us all the crucial role teachers and mentors play in our life, but that makes also visible the fertile relationship in the art realm between mentor and mentee, be it expressed in continuity or in break and separation. 'FRIDGE', heating up the art world! ... joined by a guest underground artist from the local community, took over a debilitated refrigeration unit and transformed it into an art exhibition. 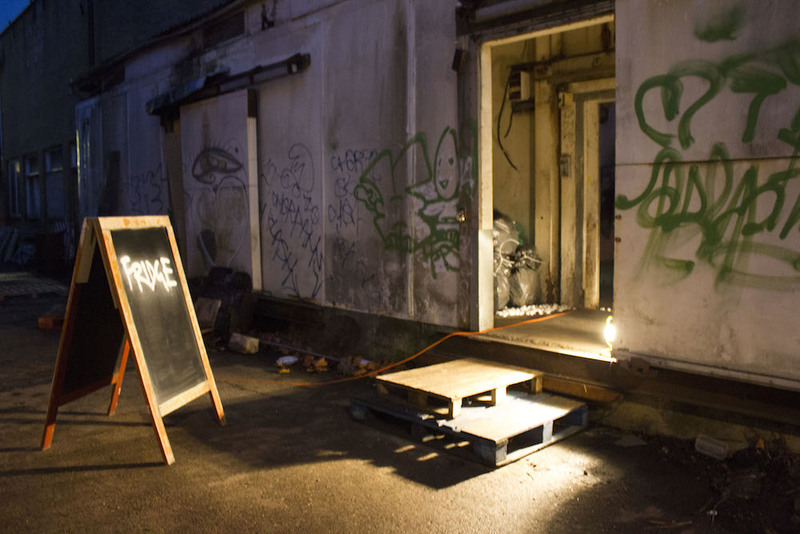 FRIDGE, opened for one night only in Seven Sisters, North London on the 12th of December, was a creative project within which the artists re-appropriated an abandoned building, bringing it back to life. It all started when the group, consisting of British, European and International artists, came together to accomplish a “live project”, a project that would situate their practice in London, aimed at the city’s art scene audience. The space, fittingly nicked named FRIDGE and known for its illegal parties over the summer of 2017 within the London underground rave scene, was offered to the artists as an experiment to elevate the underlying ethos to something more intrinsically creative. The vast, abandoned ice-cream fridge turned into exhibition space in North London wasn’t without its challenges. Already contained within the FRIDGE were a number of installation-based and decorative artworks from parties and festivals in the past. 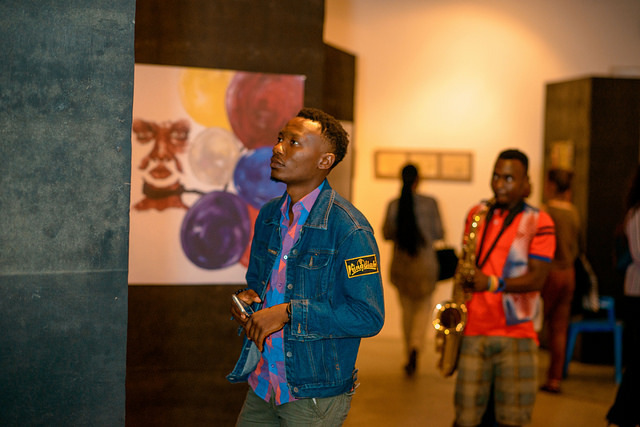 Each artist was free to interact with the artworks and the space as an extension of their own artwork, creating a new amalgamated fusion born of appropriation and spatial interaction. Battling refuse, debris, the cold, the dark and the intermittent erratic electrical supply, each artist integrated their work creating unique, site specific, creative responses. 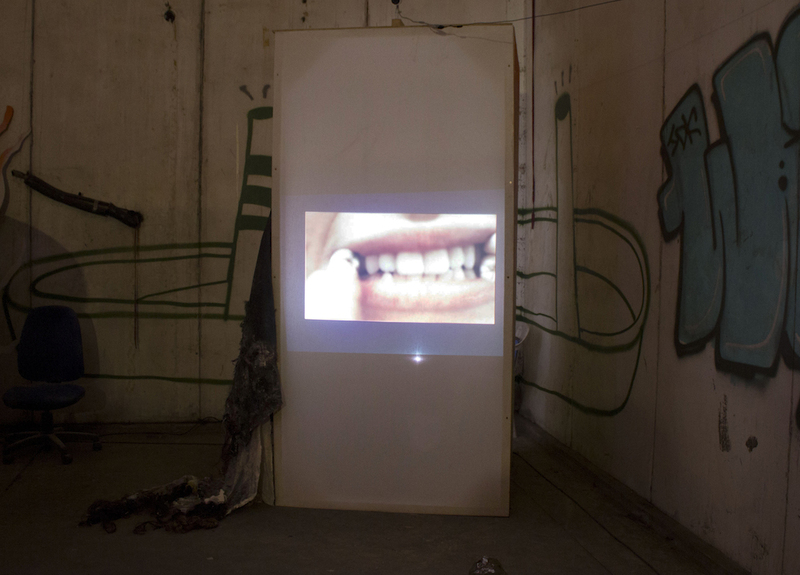 Irene Pouliassi, using an abandoned shadow dance booth, projected a video art piece that aimed to create awkward feelings as it illustrated a mouth being forced to eat and chewing human teeth, dealing with issues of identity and death. 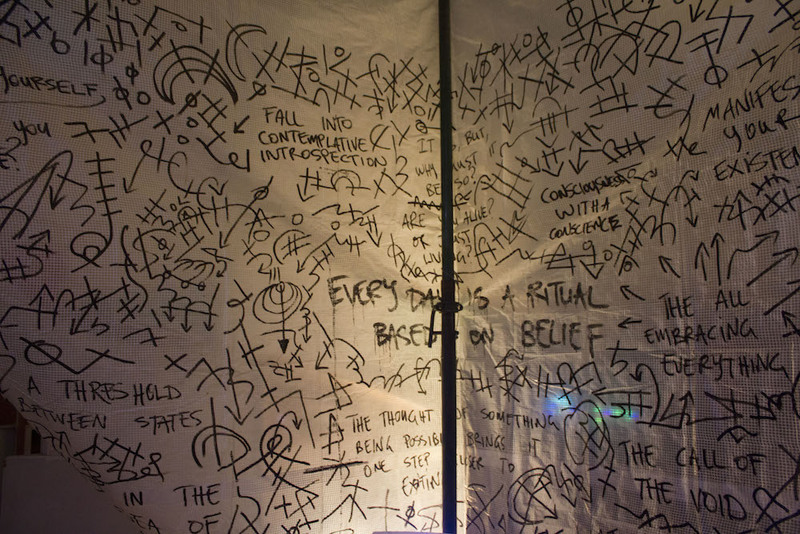 Blair Zaye’s 'Insitu Series - Stream Of Consciousness #1’ video included a projection mapped into the corner, shrouded with a translucent tarpaulin imbued with words and symbols created during a live performance a few weeks prior. This provided an ephemeral, liminal space for the viewer to become immersed in. Contained within the video is a cross over among art forms - painting becomes installation, installation becomes ritual performance, performance becomes video, video becomes live stream. The words and text are set to enlighten and awaken the viewer, an attempt to instill a type of esoteric knowledge, shedding light on that which is contained within. 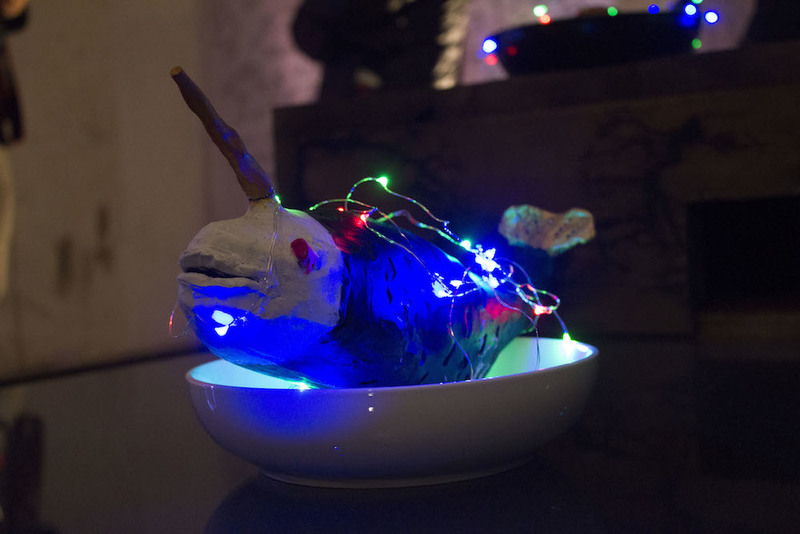 Weicung Lu displayed three sculptures of marine life, placed in used kitchenware with twinkling lights. It’s what people usually have in a fridge, transformed in a way to be more monumental by the artist. Annabel Ludovici Gray, working towards a piece for this short-lived show in a unique setting, said that impact and quick installation were concerns, given a three-hour show with limited access. Site-specificity and spontaneity of location focused her energy and physical agility. 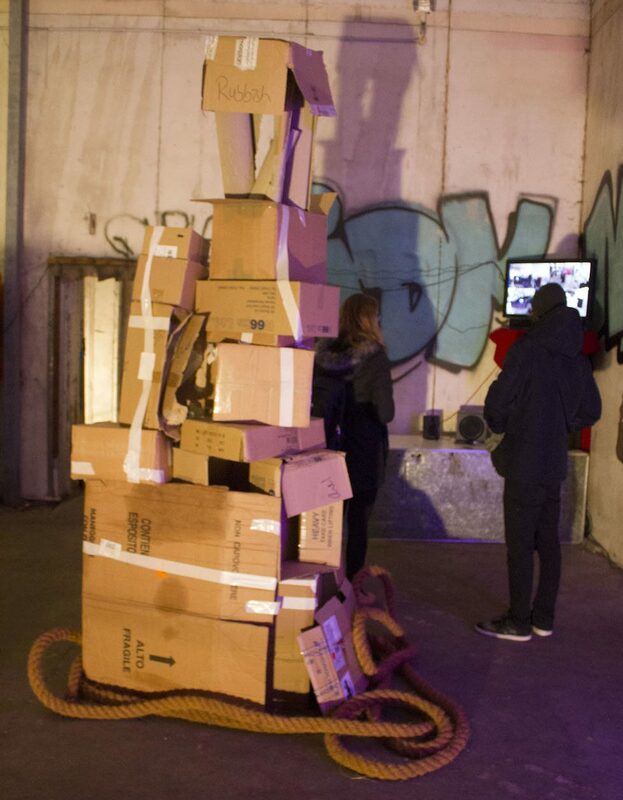 The resulting ‘Tower’ was a one-time temporal piece measuring 8’, composed of discarded empty cardboard boxes stacked irregularly to the point of collapse, displaying instability. ‘Tower’ related to the local community in which the FRIDGE is housed, referencing homelessness and vulnerability - represented as a temporary shelter, lightweight and transportable to the point of impermeability. Gardenia White stated that this exhibition was an excellent opportunity because, in addition to a display of collected works of art from different art styles and ideas in one single show, it turned an abandoned place into an art show. 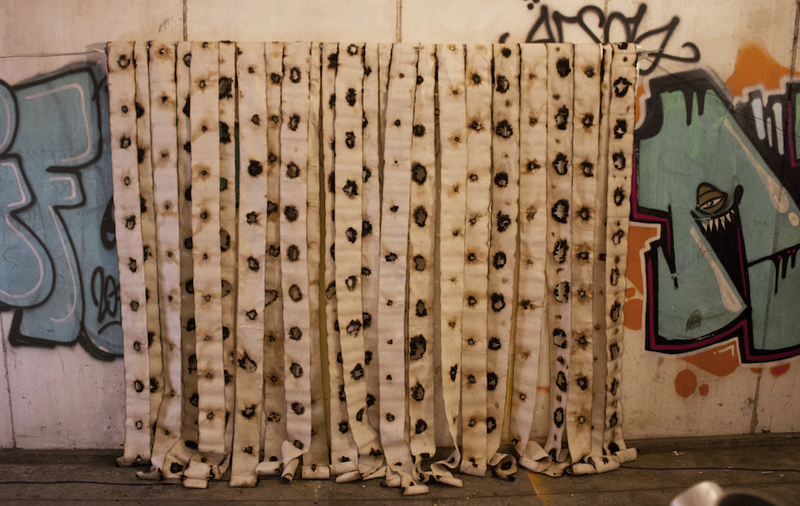 Gardenia showed a piece of work made of canvas burned strips. Each one of them had been burned from their edges, as well as from inside. This work is a manifestation of all innocent souls that are driven by violence or war. 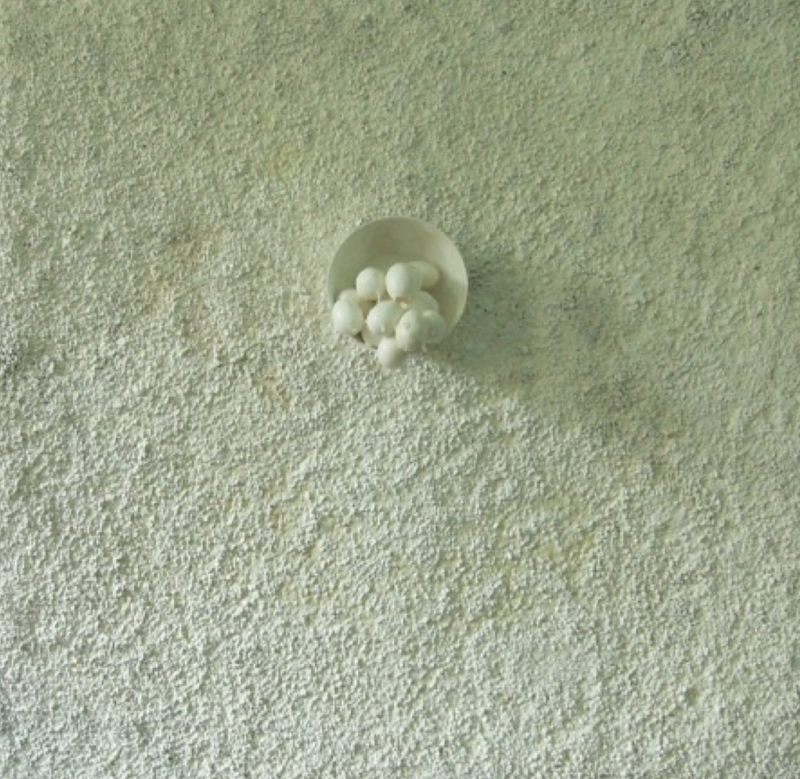 The white canvas presents the purity of innocence, while the hole made from burning shows the absence of these souls. The artist wanted to make this work as a memorial to the innocent lives of victims of the war in Iraq, as well as victims of the bombings in London, Paris, Manchester and any place around the world that has been hit by violence. 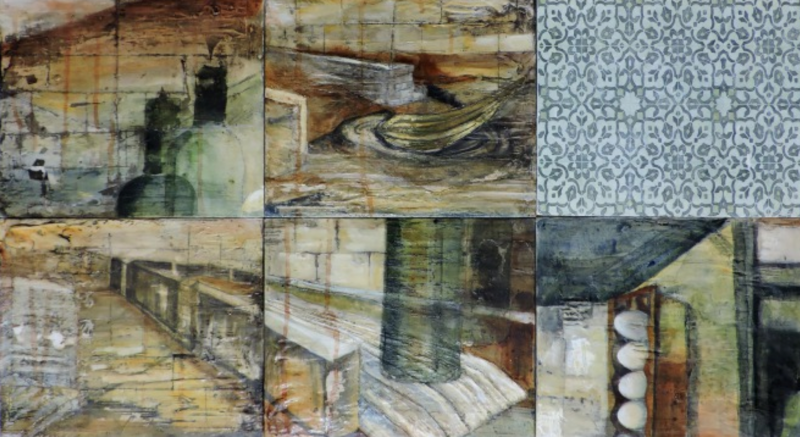 This work ‘Purity’ hangs down loosely from wall to floor in strips 320cm long by 16cm width. Robin Woodward: “Working on finding what it is to be human, how the body copes under stress and wether I, as a human, could self-institutionalize myself into a different state of being.” 'Clay Head' sees the artist fold and mold a block of terracotta clay around his head. He starts by leaving the clay to sit in position so as to mold itself. 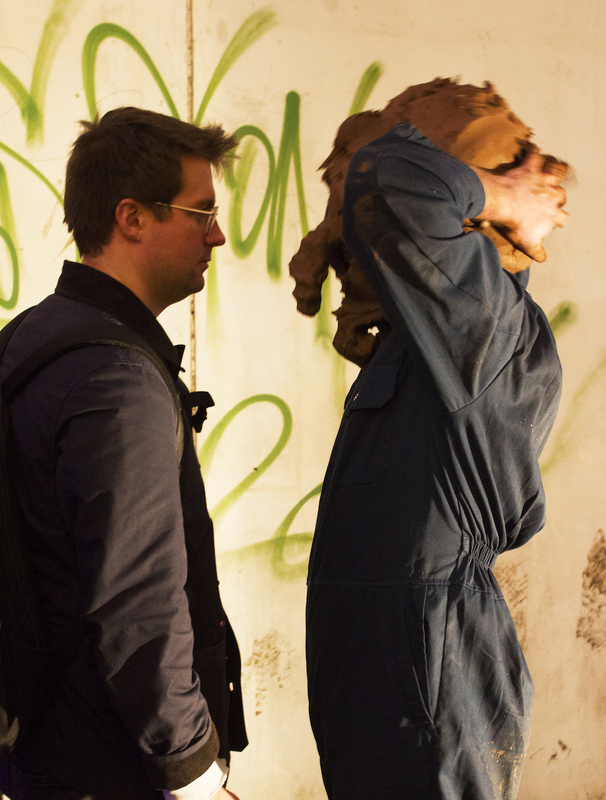 He then starts to manipulate the clay removing his ability to see and breath. The body reacts to these conditions to become something further, a fight or flight situation. The body is transformed into a being not represented as the artist. 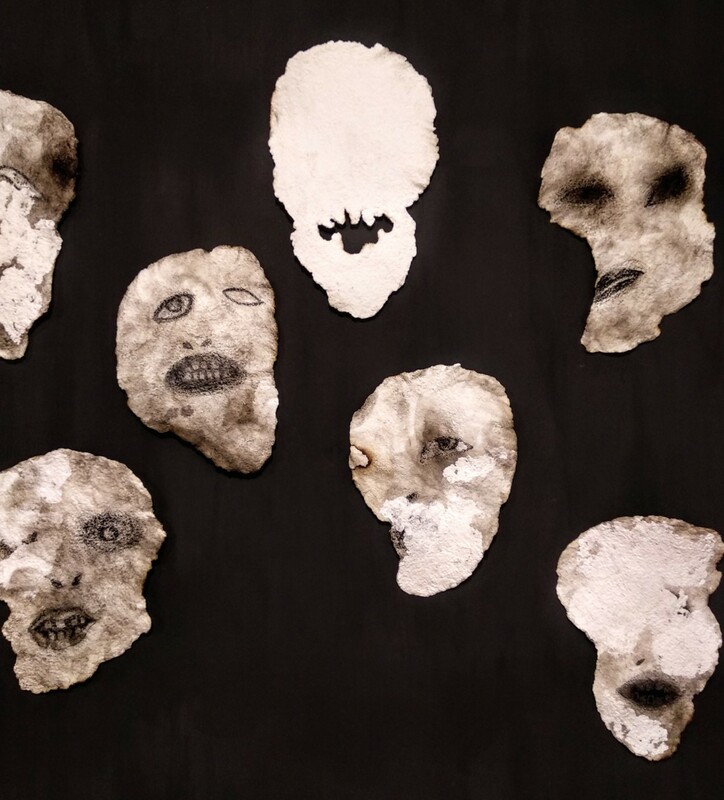 Themes appear within the atemporal sculpture such as self-harm, torture, and themes of horror, manipulation and play.